"Irmageddon" redirects here. For the Top 10 character, see Irmageddon (character). Hurricane Irma was an extremely powerful and catastrophic Cape Verde hurricane, the strongest observed in the Atlantic in terms of maximum sustained winds since Wilma, and the strongest storm on record to exist in the open Atlantic region. Irma was the first Category 5 hurricane to strike the Leeward Islands on record, followed by Maria two weeks later, and is the second-costliest Caribbean hurricane on record, after Maria. The ninth named storm, fourth hurricane, second major hurricane,[nb 1] and first Category 5 hurricane of the 2017 Atlantic hurricane season, Irma caused widespread and catastrophic damage throughout its long lifetime, particularly in the northeastern Caribbean and the Florida Keys. It was also the most intense hurricane to strike the continental United States since Katrina in 2005, the first major hurricane to make landfall in Florida since Wilma in the same year, and the first Category 4 hurricane to strike the state since Charley in 2004. The word Irmageddon was coined soon after the hurricane to describe the damage caused by the hurricane. Irma developed from a tropical wave near Cape Verde on August 30. Favorable conditions allowed Irma to rapidly intensify into a Category 3 hurricane on the Saffir–Simpson wind scale by late on August 31. However, the storm's intensity fluctuated between Categories 2 and 3 for the next several days, due to a series of eyewall replacement cycles. On September 4, Irma resumed intensifying, becoming a Category 5 hurricane by early on the next day, and acquiring annular characteristics. Early on September 6, Irma peaked with 180 mph (285 km/h) winds and a minimum pressure of 914 hPa (27.0 inHg), making it the second most intense tropical cyclone worldwide in 2017, behind only Hurricane Maria, and the strongest worldwide in 2017, in terms of wind speed. Another eyewall replacement cycle caused Irma to weaken back to a Category 4 hurricane, but the storm re-attained Category 5 status before making landfall in Cuba. Although land interaction weakened Irma to a Category 2 storm, the system re-intensified to Category 4 status as it crossed the warm waters of the Straits of Florida, before making landfall on Cudjoe Key with winds at 130 mph, (215 km/h) on September 10. Irma weakened to Category 3 status, prior to another landfall in Florida on Marco Island later that day. The system degraded into a remnant low over Alabama and ultimately dissipated on September 13 over Missouri. The National Hurricane Center (NHC) began monitoring a tropical wave over western Africa on August 26. The tropical wave moved off the coast of the continent late on August 27. Throughout the next two days, showers and thunderstorms associated with the wave became better organized and gradually coalesced into a low-pressure area, as the system passed just south of and then through the Cape Verde Islands on August 29. Around 00:00 UTC on the following day, the system developed into a tropical depression just west of the Cape Verde Islands. Six hours later, the depression intensified into Tropical Storm Irma, based on scatterometer data and satellite estimates. With warm sea surface temperatures and low wind shear, strengthening was anticipated, with the only hindrance being slightly cooler waters and drier air. 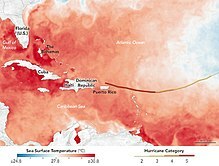 Sea surface temperatures in Hurricane Irma's path. The nascent storm began developing upper-level poleward outflow, as an anticyclone became established over the system, with banding features becoming increasingly evident in satellite images. Early on August 31, shortly after the development of a central dense overcast (CDO) and an eye feature, Irma underwent rapid intensification, becoming a Category 2 hurricane at 18:00 UTC and then a Category 3 hurricane, becoming a major hurricane – around 00:00 UTC on September 1. In a 48-hour period, the hurricane's intensity had increased by 65 mph (105 km/h). On September 2, a ship passed 60 mi (97 km) to the west of the center of Irma, recording maximum winds of 45 mph (72 km/h), which indicated that the eye of Irma remained compact. A strong high pressure system to the north of Irma caused the storm to move west-southwestward between September 2 and September 4. The first aircraft reconnaissance mission departed from Barbados on the afternoon of September 3, discovering an eye 29 mi (47 km) in diameter and surface winds of 115 mph (185 km/h). On September 4, after moving into more favorable conditions, Irma strengthened into a Category 4 hurricane. As it continued approaching the Leeward Islands, Irma underwent a second and more robust period of rapid intensification, becoming a Category 5 hurricane by 12:00 UTC on the following day, with winds of 175 mph (280 km/h). As it began to take on annular characteristics, the extremely powerful hurricane continued to intensify, with maximum sustained winds peaking at 180 mph (285 km/h) near 18:00 UTC on September 5. Irma continued to intensity while approaching the northern Leeward Islands. Almost eight hours later, around 05:45 UTC on September 6, Irma made landfall along the northern coast of Barbuda at peak intensity, with the storm's central minimum pressure having bottomed out at 914 mbar (27.0 inHg) – this was the lowest in the Atlantic since Dean in 2007; the storm also made landfall with maximum sustained winds of 180 mph (285 km/h). Irma continued to maintain its peak intensity until 12:00 UTC on September 6 and made additional successive landfalls on that same day, at 11:15 UTC on Sint Maarten, and at 16:30 UTC on Virgin Gorda, in the British Virgin Islands, though the storm's central pressure had risen slightly prior to its third landfall. Three simultaneously active hurricanes on September 7. From left to right: Katia, Irma, and Jose, the first occurrence since 2010. As the hurricane moved away from the Virgin Islands late on September 6, observations from reconnaissance flights, as well as Doppler radar in San Juan, Puerto Rico, indicated an elliptical eye and double eyewalls. 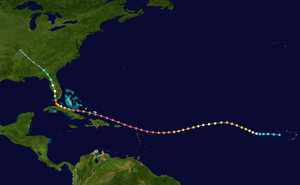 Late on September 6, the cyclone passed about 60 mi (97 km) north of Puerto Rico. Moving west-northwestward, Irma closely paralleled the north coast of Hispaniola throughout the day on September 7. After beginning an eyewall replacement cycle, Irma weakened to a Category 4 hurricane as it passed south of the Turks and Caicos Islands early on September 8. This subsequently ended the 60-hour contiguous period of Irma maintaining Category 5 intensity, the second longest any Atlantic storm had maintained winds above 156 mph (251 km/h) – behind only the 1932 Cuba hurricane. At 05:00 UTC on September 8, Irma made landfall on the island of Little Inagua in the Bahamas with sustained winds of 155 mph (250 km/h). The hurricane then began tracking more to the west due to the intensification of a subtropical ridge to its north. Once the eyewall replacement cycle was complete, Irma began to re-intensify, and it re-attained Category 5 intensity at 18:00 UTC that day east of Cuba as deep convection became more pronounced and organized. The hurricane then made landfall in Cayo Romano, Cuba, at 03:00 UTC on September 9, with winds of 165 mph (270 km/h). This made Irma only the second Category 5 hurricane to strike Cuba in recorded history, after the 1924 Cuba hurricane. As the eye of Irma moved along the northern coast of Cuba, gradual weakening ensued due to land interaction, with the eye becoming cloud-filled and the intensity falling to a high-end Category 2 storm later on September 9. After slowing down late on September 9, the hurricane turned northwestward towards Florida around the southwestern edge of the subtropical high to its northeast and a low-pressure system that was located over the continental United States. Moving over the warm waters of the Straits of Florida, Irma quickly restrengthened to a Category 4 hurricane at 06:00 UTC on September 10, as deep convection improved and the eye becoming better defined. In addition, Irma's wind field continued to increase in size, with hurricane-force winds spanning out a region of 80 mi (130 km) and gale-force winds spanning 220 mi (350 km) in diameter. The cyclone made landfall in Cudjoe Key, Florida, at 13:00 UTC on September 10, at Category 4 intensity, with winds of 130 mph (215 km/h). Increasing wind shear and land interaction caused the satellite appearance of the storm to become ragged later that day, and Irma weakened to Category 3 intensity before making its seventh and final landfall at 19:30 UTC, in Marco Island, Florida, with sustained winds of 115 mph (185 km/h). Once Irma had moved inland, it began to accelerate to the north-northwest, while rapid weakening began to occur due to the increasing wind shear, land interaction, and dry air, with the storm falling below Category 3 intensity hours after landfall. Passing east of Tampa as a weakening Category 1 hurricane around 06:00 UTC on September 11, Irma continued to weaken as most of the deep convection became more spread out towards the northern semi-circle of the circulation – though it retained a large wind field, with most of Florida experiencing gale-force winds. The system finally weakened to a tropical storm around 12:00 UTC that day as it entered southern Georgia, while acquiring some extratropical characteristics. At 06:00 UTC on September 12, Irma degenerated to a remnant low just as it entered Alabama, as most of the deep convection had diminished. The remnants persisted for another day or so before dissipating over Missouri on September 13. Given that Irma's forecast track was along much of the Caribbean island chain, hurricane warnings were issued for the northern Leeward Islands, Puerto Rico, and parts of Hispaniola on September 5. On September 4, Puerto Rico declared a state of emergency. By September 6, the U.S. Federal Emergency Management Agency had deployed response teams in Puerto Rico and the United States Virgin Islands. Supplies, including food rations, medical supplies, and blankets, were pre-staged in strategic locations on the islands for distribution. In Antigua and Barbuda, residents safeguarded their homes and cleaned up their properties in anticipation of strong winds. Emergency crews were put on standby at public shelters and hospitals by September 5 to assist with any evacuations. Expecting a direct hit, more than half of the residents on Barbuda took shelter, and relief supplies were preemptively mobilized. In Guadeloupe, low-lying and cliff-edge homes were evacuated at the threat of flooding and erosion. Schools and public businesses closed on September 5 and 6. Hospitals stocked up on three days' worth of supplies and checked the functionality of their generators. Of the island's 32 municipalities, 22 activated their emergency plans; 1,500 people were urged to take shelter. The island sustained relatively minor damage and became the base for relief efforts on St. Martin (Collectivity of Saint Martin) and St. Barts (Saint Barthélemy). Though the core of the hurricane was expected to remain north of the island, a yellow alert was issued for Martinique due to the likelihood of rough seas. The island dispatched relief supplies and military reinforcements to its neighboring islands of Guadeloupe, Saint Martin and Saint Barthélemy, which faced a greater risk of a direct impact. The National Emergency Management Organization on Saint Lucia urged small craft operators and swimmers to be mindful of forecasts for high surf. Small Craft Warnings and High Surf Advisories were hoisted for Dominica, where residents were urged to remain vigilant of the potential for high waves, landslides, and flooding. On September 5, the Dominican Republic activated the International Charter on Space and Major Disasters, thus providing for humanitarian satellite coverage; the United States and Haiti followed suit two days later. According to officials, 11,200 people were evacuated from vulnerable areas prior to the storm's arrival. 7,400 tourists were moved to Santo Domingo, away from beach resorts. In Haiti, government officials and aid organizations struggled with early preparation and evacuation efforts. While some officials blamed reluctance and indifference on the part of the population, others "admitted they were not prepared for the onslaught and no mandatory evacuation orders were in place ahead of Irma's approach," per The Guardian. Local officials contended that they had not received promised funds, supplies, or equipment from the national government. The United Nations Stabilization Mission in Haiti prepared its 1,000 peacekeepers and engineers to assist. In Cuba, meteorologists did not initially predict a direct hit. Fuel conservation was enacted in Camagüey Province to ensure that enough would be available during post-storm power outages. The Civil Defense evacuated nearly one million people from low-lying areas, including thousands of Canadian and European tourists in the Jardines del Rey. Dolphins at a Cayo Guillermo resort were evacuated by helicopter. The NHC issued several watches and warnings for the Southeastern United States. The first watches and warnings were issued at 15:00 UTC on September 7, which was a hurricane watch from the Jupiter Inlet to Bonita Beach, including the Florida Keys and Lake Okeechobee. The watches and warnings were extended into Georgia and South Carolina on September 9. At 21:00 UTC on that day, the advisories reached their maximum extent, with a hurricane warning covering the entire east coast of the state, the west coast from Indian Pass southward, and the Florida Keys; a hurricane watch was in place from the Florida–Georgia state line to Edisto Beach, South Carolina; and there were two tropical storm warnings, one in Florida from Indian Pass to the Okaloosa–Walton county line and the other from the Florida–Georgia state line to the South Santee River in South Carolina. Watches and warnings were gradually discontinued as Irma moved inland and weakened, with all of them canceled by early on September 12. On September 4, Florida Governor Rick Scott declared a state of emergency. Governor Scott placed 100 members of the Florida National Guard on duty to assist in preparations. All 7,000 troops were ordered to be on duty by September 8. Officials advised residents to stock their hurricane kits. The state coordinated with electrical companies in order for power outages to be restored as quickly as possible, extending resources such as equipment, fuel, and lodging for the approximately 24,000 restoration personnel who had been activated. Governor Scott suspended tolls on all toll roads in Florida, including the turnpike. All state offices in Florida were closed from September 8 to September 11, while public schools, state colleges, and state universities in all 67 counties were closed during the same period. The Florida Department of Education coordinated with school districts as the need for transportation by school buses and opening shelters arose. By September 9, more than 150 state parks were closed. Throughout the state, almost 700 emergency shelters were opened. The shelters collectively housed about 191,764 people, with more than 40% of them staying in a shelter in South Florida, including 31,092 in Miami-Dade County, 17,263 in Palm Beach County, 17,040 in Collier County, and 17,000 in Broward County. Additionally, more than 60 special needs shelters were opened, which housed more than 5,000 people by September 9. Many airports across the state, particularly in Central and South Florida, were closed. Nearly 9,000 flights intending to arrive in or depart from Florida were canceled. Along Florida's coasts, the seaports of Canaveral, Key West, Manatee, Miami, Palm Beach, and Port Everglades, and St. Petersburg were closed, while the ports at Fernandina, Jacksonville, Panama City, and Pensacola were opened, but with restricted access. For the fifth time in its 45-year history, the Walt Disney World Resort was completely closed due to the storm. Its theme parks, water parks, and Disney Springs were all closed by 9:00 p.m. on September 9 and remained closed until September 12. Other Orlando-area theme parks, including Universal Orlando Resort and SeaWorld Orlando, were also closed. The Kennedy Space Center was closed from September 8 to September 15. An estimated 6.5 million Floridians were ordered to evacuate, mostly those living on barrier islands or in coastal areas; in mobile or sub-standard homes; and in low-lying or flood prone areas. Mandatory evacuations were ordered for portions of Brevard, Broward, Citrus, Collier, Dixie, Duval, Flagler, Glades, Hendry, Hernando, Indian River, Lee, Martin, Miami-Dade, Orange, Palm Beach, Pasco, Pinellas, Sarasota, Seminole, St. Lucie, Sumter, and Volusia counties. All of Monroe County, where the Florida Keys are located, was placed under a mandatory evacuation. Residents in communities near the southern half of Lake Okeechobee were also ordered to leave. Additionally, voluntary evacuation notices were issued for all or parts of Alachua, Baker, Bay, Bradford, Charlotte, Columbia, Desoto, Hardee, Highlands, Hillsborough, Lake, Manatee, Okeechobee, Osceola, and Polk counties. A record 6.5 million Floridians evacuated, making it the largest evacuation in the state's history. 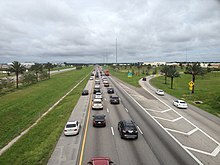 Evacuees caused significant traffic congestion on northbound Interstate 95, Interstate 75, and Florida's Turnpike, exacerbated by the fact that the entire Florida peninsula was within the cone of uncertainty in the NHC's forecast path in the days before the storm, so evacuees from both coasts headed north, as evacuees would not be safer by fleeing to the opposite coast. Fuel was in short supply throughout peninsular Florida during the week before Irma's arrival, especially along evacuation routes, leading to hours-long lines at fuel stations and even escorts of fuel trucks by the Florida Highway Patrol. Use of the left shoulder as a lane for moving traffic was allowed on northbound Interstate 75 from Wildwood to the Georgia state line beginning September 8 and on eastbound Interstate 4 from Tampa to State Road 429 near Celebration for a few hours on September 9. It was the first time that the shoulder-use plan, which was introduced at the start of the 2017 hurricane season, was implemented by the state for hurricane evacuations. The shoulder-use plan was implemented in place of labor- and resource-intensive contraflow lane reversal, in which both sides of an interstate highway are used for one direction of traffic. Officials from the Environmental Protection Agency, which had been criticized for its response to Hurricane Harvey, took special measures to inspect and secure hazardous materials, especially at Superfund sites. Direct Relief, a disaster relief organization, coordinated with local health centers and provided resources to help facilities on the front lines of Floridian and Puerto Rican communities. Georgia Governor Nathan Deal declared a state of emergency initially for all six coastal counties on September 6; however, the state of emergency was expanded to cover 30 counties in southeast and east central Georgia, and Governor Deal ordered mandatory evacuations for all areas east of Interstate 95 on September 7. Contraflow lane reversal for Interstate 16 took effect on the morning of September 9 from Savannah to Dublin, Georgia. On September 8, Governor Deal further expanded the state of emergency to cover 94 counties south of the Atlanta metropolitan area, with mandatory evacuations expanded to include the entirety of Chatham County as well as low-lying areas west of I-95. In total, 540,000 people on the Georgia coast were ordered to leave. On September 10, the state of emergency for Georgia was extended to cover the entire state, while Atlanta was placed under its first-ever tropical storm warning. All Georgia state parks were open for free to evacuees, as was the 800-acre camping area at Atlanta Motor Speedway. Reversible HOT lanes on Interstate 75 in Georgia through south metro Atlanta were open 24 hours northbound with no tolls. North Carolina Governor Roy Cooper declared a state of emergency on September 6, with South Carolina Governor Henry McMaster following suit the same day. Governor of Virginia Terry McAuliffe declared a state of emergency on September 8 in order to protect Virginia residents and to mobilize resources in support of neighboring states. Charlotte Motor Speedway in Concord, North Carolina, opened their campgrounds to evacuees free of charge. Officials in New Orleans stated that there would not be much time for preparations if Irma failed to make the projected northward turn, but that South Texas or Florida would not be a good evacuation destination. Talladega Superspeedway near Talladega, Alabama, opened their campgrounds to evacuees free of charge. On September 10, Tennessee Governor Bill Haslam issued an executive order allowing medical professionals in other states to practice in Tennessee to aid Hurricane Irma evacuees. This order also allowed pharmacies to give out 14-day supplies of medicine, and gave women and children from outside the state the ability to participate in the Tennessee Department of Health programs. Bristol Motor Speedway in Bristol, opened their campgrounds to evacuees free of charge. In professional sports, the Miami Dolphins–Tampa Bay Buccaneers game scheduled for September 10 at Hard Rock Stadium in Miami was postponed to November 19 due to the storm's threat. The Dolphins left early for their road game against the Los Angeles Chargers. Although their schedule was not affected by Irma, the Jacksonville Jaguars remained in Houston until September 12, two days after their game against the Texans. The Tampa Bay Rays and New York Yankees had their September 11–13 series moved from Tropicana Field in St. Petersburg to Citi Field, in Queens. Minor League Baseball's Florida State League, Carolina League, and Southern League called off their championship finals and as a result, named their division series winners league co-champions. The Miami FC versus San Francisco Deltas match on September 10 was cancelled so the players and staff could prepare for the storm with their families. The Orlando Pride of the National Women's Soccer League rescheduled their September 9 match to September 7. Orlando City SC of Major League Soccer did not have any scheduled home games in September, but was unable to return to training facilities in Orlando due to Hurricane Irma. In college football, the UCF Knights-Memphis Tigers game set to take place at 20:00 EDT on September 9 was moved to September 30, replacing UCF's game against Maine and Memphis game against Georgia State. UCF also cancelled their game against Georgia Tech originally scheduled for September 16, as UCF's stadium hosted the National Guard. The USF Bulls-Connecticut Huskies football game was also cancelled. The Miami Hurricanes–Arkansas State Redwolves game scheduled for September 9 at Centennial Bank Stadium in Arkansas was canceled due to travel concerns for the University of Miami. The Florida Gators-Northern Colorado Bears match in Gainesville, originally scheduled for September 9 was cancelled. The Florida State Seminoles contest against the Louisiana–Monroe Warhawks was canceled on September 8. The Seminoles' rivalry game with the Hurricanes in Tallahassee, originally scheduled for the following Saturday, September 16, was postponed three weeks later to October 7. The FIU Panthers game against the Alcorn State Braves was moved up a day and relocated to Legion Field in Birmingham, Alabama. The Georgia Southern Eagles game against the New Hampshire Wildcats on September 9 was also moved to Legion Field for that day. As of September 5, Federal Emergency Management Agency (FEMA) funding was running dangerously low, due to its response to Hurricane Harvey in Texas the previous week, prompting the Trump administration to request an immediate $8 billion in additional funding as Irma approached Florida. Given the rate that current funds are being consumed and the catastrophic damage, the United States Senate almost doubled the requested amount to $15.3 billion, with the understanding that this would only be about 10% of what will be required for responding to Harvey. Hurricane Irma's path was such that its impact was both far-reaching and devastating, with landfalls in Antigua and Barbuda, Saint Martin, the Bahamas, Cuba, and the United States, all at major hurricane intensity. Furthermore, the size of the storm system meant that destruction was prevalent even in territories well removed from landfall occurrences. The eyewall of the hurricane moved over Barbuda near its record peak intensity early on September 6; a weather station observed a wind gust of 160 mph (257 km/h). Although reports of structural damage such as blown off roofs surfaced shortly after, the exact state of the island remained unclear for hours after Irma's passage, as downed phone lines ceased all communication with nearby islands. Later that afternoon, Prime Minister Gaston Browne surveyed the territory by helicopter, revealing an effectively uninhabitable island. Irma damaged or destroyed 95% of the structures on Barbuda, including its hospital, schools, and both of its hotels; it completely flattened some residential blocks while submerging others. The destruction rendered the island's sole airport and much of its infrastructure inoperative—including water and telecommunication services—which further hampered relief efforts. Property damage on Barbuda ranged from $150 million to $300 million. A total of three storm-related deaths have been reported on the island. In addition to the catastrophic impact on Barbuda's human residents, concern turned to the storm's effects on the island's wildlife. The island's only endemic bird, the near-threatened Barbuda warbler, numbered less than 2,000 individuals prior to the hurricane. It is unknown if the warbler survived the hurricane or its aftermath. Barbuda's Codrington Lagoon, home to the largest colony of magnificent frigatebirds in the Caribbean, with an estimated 2,500 nesting pairs, was also inundated by the storm surge. Remaining just outside of Irma's strongest windfield, Antigua sustained less severe damage, in the form of leveled roofs and fences, downed power poles and lines, and uprooted trees. Some street flooding also took place in low-lying areas. Three people were treated for minor storm-related injuries. Forensic disaster analysts from the Center for Disaster Management and Risk Reduction Technology (CEDIM), a Germany-based risk management agency, estimate that economic losses for Antigua and Barbuda will exceed $120 million. On the morning of September 6, Irma's center crossed the island of Saint Martin while the storm was at peak intensity, sweeping away entire structures, submerging roads and cars, and triggering an island-wide blackout. Irma's extreme winds ripped trees out of the ground and sent vehicles and debris from damaged structures scattered across the territory. On the French side of Saint-Martin, entire marinas around Marigot were left in ruins, littered with the stranded remnants of boats that had smashed into each other. A hotel caught on fire, but dangerous conditions and impassable roads prevented firefighters from putting out the blaze. Another hotel lost nearly all of its ground floor. Media images depicted devastated room interiors with furniture hurled around after the winds had shattered their windows. Irma killed four people on the French side of the island and injured 50 others, one of whom was in critical condition. As many as 95% of the buildings there were damaged to some degree; 60% of those were totally uninhabitable. Estimates from CEDIM indicate a minimum of $950 million worth of economic losses. Total loses exceeded €3.5 billion ($4.07 billion USD). A similar situation unfolded in Sint Maarten, Saint Martin's Dutch half, as intense winds ripped through buildings and lifted vehicles aloft "as if they were matches". The hurricane wreaked havoc on Princess Juliana International Airport, with "huge chunks of the building [strewn] across the runway and a jet bridge snapped in half." It demolished or severely damaged about 70% of Sint Maarten's houses, forcing thousands of residents into public shelters. There were 4 deaths and 23 injuries, 11 of which were serious, in the Dutch territory. Irma is considered the worst natural disaster to hit Sint Maarten; the extent of its damage far exceeded that of any previous hurricane. Prime Minister William Marlin estimates that at least €1 billion ($1.2 billion) will be necessary to restore the destruction, while disaster analysts from CEDIM predict losses will exceed $1.5 billion. Irma left widespread destruction and disastrous flooding along its path over the French island of Saint Barthélemy, southeast of Saint Martin. Describing the extent of the destruction, one local compared it to "a bomb that burned all vegetation," while another said that it were as if the hurricane had effectively "erased the island from the map". Violent seas swept away entire coastal establishments, with one hotel being stripped of all but its foundation. Streets in the capital of Gustavia were turned into rushing rivers, which carried away vehicles and pieces of furniture. The island's fire station was inundated with up to 6.4 ft (2.0 m) of flood waters. With scores of homes and much of the infrastructure destroyed, the majority of the island's population was left stranded and without water, electricity or phone service. The associated economic losses could exceed $480 million according to CEDIM's analysts. Preliminary assessments from the French government indicate that Hurricane Irma caused a combined €1.2 billion ($1.44 billion) in insured losses across the French territories of Saint-Martin and Saint Barts. This total covered private property such as homes, vehicles and businesses (including lost revenue); the extent of the damage to infrastructural and public facilities remains undetermined. Nonetheless, this made Irma one of the costliest natural disasters to hit the French Republic in 50 years. On January 30, 2018, roughly five months after Irma, an analysis was published indicating that an anemometer on the island recorded an unofficial gust to 199 mph (320 km/h) before failing. The British Overseas Territory of Anguilla saw the eyewall of the storm pass over it on September 6. Many homes and schools were destroyed, and the island's only hospital was badly damaged. The devastation was particularly severe in East End, where the winds uprooted scores of trees and power poles and demolished a number of houses. In The Valley, the island's capital, the hurricane blew out the windows of government buildings. Rough seas inflicted heavy damage upon several bays and harbors, and a seaside restaurant was completely eradicated. About 90% of roads were left impassable. The island's air traffic control tower was damaged, exacerbating the already poor communication with the island. One death was reported on the island. Estimates of losses on the island total at least $190 million. Large swells ahead of Irma washed ashore debris and sea life in Castries, Saint Lucia, blocking some roads. Seaside roads were inundated with water. One surfer was killed amid rough surf in Barbados after hitting a reef and breaking his neck. Trees were also destroyed. The hurricane's effects, such as violent seas and rattling trees, were intense enough to be detected by seismographs in Guadeloupe. Several houses were damaged. Around 8,000 households and a water supply network on that island lost power during the storm, leaving several communes in the dark without running water. Overall damage was limited to external parts of houses and trees that were blown onto roads and three unmanned ships wrecked by rough seas. Saint Kitts and Nevis endured similar conditions to other islands. Blustery rainstorms triggered scattered power outages and disabled the island's water system, but per the International Red Cross, the islands were spared the level of destruction seen elsewhere. Still, Prime Minister Timothy Harris stated that property and infrastructure had sustained "significant damage." The Dutch territories of Saba and Sint Eustatius were also struck by the hurricane's winds, resulting in infrastructural damage, water shortages and telecommunication outages. Several houses were left uninhabitable. On Saba, the hurricane also defoliated trees and injured a few people. CEDIM's analysts expect economic losses of $20–65 million for the two islands. 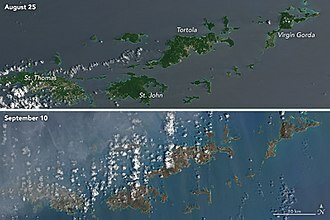 Operational Land Imager imagery by Landsat 8 of the Virgin Islands from before and after Hurricane Irma's impact, depicting a "browning" of the landscape and vegetation. Damage in the British Virgin Islands was extensive. Numerous buildings and roads were destroyed on the island of Tortola, which bore the brunt of the hurricane's core. Four people were confirmed dead. Along Cane Garden Bay, the storm surge submerged several seaside bars and a gas station. Satellite images revealed many of the island's residential zones had been left in ruins. The hurricane passed over Necker Island, also causing severe damage and destroying the mansion of Richard Branson. Most homes and businesses were destroyed on the island of Jost Van Dyke, the smallest of the B.V.I. 's four main islands. The Governor, Gus Jaspert, who had only been sworn into office 13 days previously, declared a state of emergency - the first time this has ever happened in the Territory. After the storm, restoration of electricity took approximately 5 months. Irma's effects in the U.S. Virgin Islands were most profound on Saint Thomas, where at least 12 inches (305 mm) of rain fell, and on Saint John. Saint Thomas island suffered widespread structural damage, including to its police station and airport. Patients from the fourth and third floors of Charlotte Amalie's hospital had to be relocated to lower floors due to flooding from roof leaks. Three deaths were attributed to Irma on the island. On nearby Saint Croix, there were communication issues and some damage to the infrastructure. Saint John lost access to ferry and cargo services, along with access to the local airport. Due to its normal reliance on electricity from Saint Thomas, the island was left without power. The hurricane passed north of Puerto Rico, but still caused significant damage to the United States territory. Along the coast, a tide gauge observed waves up to 1.5 ft (0.46 m) mean higher high water. Much of the main island experienced sustained tropical storm force winds, with a peak sustained wind speed of 55 mph (89 km/h) at a weather station along San Juan Bay, while the same site observed a peak wind gust of 74 mph (119 km/h). However, on the island of Culebra, a wind gust of 111 mph (179 km/h) was reported. Mainly due to strong winds, approximately 1.1 million out of 1.5 million of Puerto Rico Electric Power Authority's customers lost electricity. Portions of Puerto Rico received heavy rainfall, with a peak total of 13.04 in (331 mm) in Bayamón, causing seven rivers to reach flood stage, widespread flash flooding, and at least six landslides. The most severely impacted areas included the offshore islands of Culebra and Vieques, as well as the northeastern, northern, and mountainous portions of the main island. On Culebra, the island suffered an almost complete loss of electrical and water services. At least 30 homes on the island were destroyed, while about 30 other experienced substantial damage. High winds also toppled a number of trees. The only telecommunications tower on Culebra sustained damage, cutting off outside communications for several hours. In rural Loíza, 79 homes were destroyed. Throughout Puerto Rico, 781 out of 1,600 telecommunications towers went out of commission, primarily due to power outages. At least 362,000 customers lost water services. Debris, mostly fallen trees, blocked at least 72 roads. Approximately 25% to 30% of banana, coffee, papaya, and plantain crops were damaged by strong winds, with losses to farmers estimated at $30.6 million. Approximately 1,530 homes experienced at least moderate damage, with 1,448 homes moderately damaged, 32 extensively damaged, and 50 completely destroyed. Hurricane Irma was attributed to approximately $759.4 million in damage and four fatalities in Puerto Rico. Two people died due to rainstorms ahead of the hurricane: one man died in Orocovis after falling off his ladder while repairing his roof; another man on the coast in Capitanejo died after being struck by lightning. Three nearby fishermen were burned by the same lightning strike, but survived. Two other people died during the hurricane: a woman died while being evacuated from her house in a wheelchair and fell, hitting her head; another person died in a car accident in Canóvanas. Governor Ricardo Rosselló declared the islands of Culebra and Vieques to be disaster areas. People stand in a flooded street that usually serves as a farmers market, in Ouanaminthe, northeast Haiti, September 8, 2017. Although spared a direct hit, both the Dominican Republic and Haiti were affected by high winds and heavy rains. A bridge over the Dajabón River connecting the two countries was broken. In Haiti, flooding one meter deep sat in residential neighborhoods in places like Cap-Haïtien, Ouanaminthe, and Gonaives. Mudslides, destroyed homes, flooded crops, and infrastructure damage were reported in the northern part of the country. The total expanse of the flooding stretched from Môle-Saint-Nicolas in the west to the eastern border with the Dominican Republic. On the evening of September 7, at 7:30 pm AST (23:30 UTC), Hurricane Irma reached the Turks and Caicos Islands. While the eye passed just south of the main islands, crossing over South Caicos and the Ambergris Cays, the most powerful winds on the northern side of the eye swept all of the islands for more than two hours. Communications infrastructure was destroyed. On September 8, Minister of Infrastructure Goldray Ewing confirmed that damage to Providenciales was extensive, with the northwestern neighborhood of Blue Hill being "gone". The hospital in the capital, Cockburn Town, was heavily damaged. On South Caicos, 75% of roofs were lost. Total damage was estimated at over $500 million. Damages were largely confined to the southern islands starting the morning of September 8. On Mayaguana and Great Inagua, downed power lines knocked out communications. On Great Inagua, 70% of homes sustained roof damage, and the island's school lost its roof entirely. The Morton Salt Company's signature production facility, one of the major employers in the country, experienced millions of dollars in damages. The Acklins settlement of Salina Point was cut off from the rest of the island by flooding, while Crooked Island had widespread roof damage. In the northern Bahamas, the worst property damage came on September 10 as the outer bands of the system produced tornadic activity on Grand Bahama and Bimini. Damage and losses across The Bahamas amounted to $135 million. While Irma was making landfall in Florida, the ocean was drawn away from some western shorelines of the Bahamas due to strong easterly winds. Patrol boat Admiral Didiez Burgos of the Dominican Navy delivering disaster supplies in Havana Harbor after Hurricane Irma. Early on September 9, Irma made landfall on the Camagüey Archipelago off the northern coast of Cuba, with sustained winds of 165 mph (270 km/h). The strongest official sustained wind speed was 124 mph (200 km/h), while the highest wind gust reached 159 mph (256 km/h); both were observed near Camila in Ciego de Ávila Province. The weather station at Esmeralda, Camagüey, was damaged, with the wind gauge destroyed. The north coast of Cuba experienced significant coastal flooding due to storm surge and abnormally high tides generated by the storm. Wave heights at Cayo Romano exceeded 26 ft (7.9 m). Storm surge penetrated as far as 1.2 mi (1.9 km) inland in some areas of Villa Clara Province. Multiple locations on the island observed at least 10 in (250 mm) of rainfall, with a peak total of 23.9 in (610 mm) of precipitation at Topes de Collantes. A total of 158,554 homes experienced some degree of damage, of which 14,657 were destroyed; approximately 1.9 million people experienced the direct effects of Irma. The storm partially deroofed 103,691 homes, while 23,560 were completely deroofed. Irma damaged or destroyed 980 health facilities and 2,264 schools. Approximately 3.1 million people experienced disruptions to the water supply, while 246,707 people lost telephone service. About 334 mi (538 km) of roads were damaged. Crops also suffered extensively, with nearly 235,000 acres (95,000 ha) affected by the storm. Throughout the country, the hurricane inflicted 13.6 billion pesos (US$513.3 million) in damage and killed 10 people. The tourist areas of Cayo Coco, Cayo Guillermo and Cayo Santa María and the nearby town of Caibarién received the brunt of the storm, with waves rolling through town and the characteristic one-story homes completely flooded. The storm most severely Ciego de Ávila and Villa Clara provinces. Flooding worsened as the hurricane moved west, pushing the storm surge along to the regions around Havana. By the afternoon, limited flooding was occurring in Havana, including around the Malecón. Portions of province coastal flooding surpassing that which was experienced during the Storm of the Century in 1993 and Hurricane Wilma in 2005. In the city of Santa Clara, 39 buildings collapsed. Rainfall resulted in several rivers reaching major flood stage. The town of Cabaiguán in Sancti Spíritus Province in particular suffered extensive inland flooding after the Zaza River swelled. Hurricane Irma directly impacted a major colony of American flamingos on Cuba's northern Cayo Coco. Early reports from Diario de Cuba indicated that several hundred flamingos had been killed by the storm, though other estimates ranged as high as several thousand birds. Hurricane Irma affected multiple states in the South, especially Florida. Except the Florida Keys, the total damage Irma caused was not as great as government officials and forecasters had warned. Hurricane Irma weakened after making landfall in Cuba, but strengthened back into a Category 4 prior to hitting the Keys. The Florida Keys suffered the worst of the damage in the United States. After surveying the aftermath of Irma, Florida governor Rick Scott said "I thought we would see more damage" [on the mainland] but said "he witnessed devastation in the Keys". President Donald Trump commented on Twitter that the devastation in some places was "far greater than anyone thought". Damage in the United States was estimated at a minimum of $50 billion. At the time, Irma was the fourth costliest tropical cyclone in the United States, behind hurricanes Sandy in 2012, Harvey earlier that year, and Katrina in 2005. However, later in September 2017, Hurricane Maria became the third costliest United States tropical cyclone, causing Irma to fall to the fifth costliest. At least 92 people, 10 directly and 82 indirectly, died throughout the United States in relation to Hurricane Irma: 84 in Florida, 3 in Georgia, 3 in South Carolina, and 2 in North Carolina. The storm's large wind field resulted in strong winds across much of Florida, except for the western Panhandle. The highest reported sustained wind speed was 112 mph (180 km/h) on Marco Island, while the strongest observed wind gust was 142 mph (229 km/h), recorded near Naples, though wind gusts of 150 to 160 mph (240 to 260 km/h) likely occurred in the Middle Florida Keys. More than 7.7 million homes and businesses in Florida were left without electricity at some point – approximately 73.33% of state. Generally heavy amounts of rainfall were recorded to the east of the Irma's path, including a peak total of 21.66 in (550 mm) in Fort Pierce. Heavy precipitation – and storm surge, in some instances – overflowed at least 32 rivers and creeks, causing in significant flooding, particularly along the St. Johns River and its tributaries. Many homes and businesses suffered damage or destruction, with more than 65,000 structures damaged to some degree in West Central and Southwest Florida alone. Agriculture experienced about $2.5 billion in damage. It was estimated that the cyclone caused at least $50 billion in damage, making Irma the costliest hurricane in Florida history, surpassing Hurricane Andrew. Throughout Florida, at least 84 people died in storm-related incidents. About half of the deaths occurred from drowning, trauma, and carbon monoxide poisoning. The first Irma-related death in Florida occurred on September 8, when a man fell off a ladder while installing hurricane shutters in Davie. Broward County had 21 fatalities, the most of any county in Florida. Among those deaths were 12 people at The Rehabilitation Center at Hollywood Hills, a Hollywood nursing home. The patients died from sweltering heat worsened by the lack of air conditioning. The hurricane also left at least 14 deaths in Monroe County (location of the Florida Keys); 6 deaths in Orange County; 5 deaths each in Duval, Miami-Dade, and Palm Beach counties; 4 deaths in both Highlands and Hillsborough counties; 3 deaths in both Marion and Polk counties; 2 deaths each in Collier, Hardee, Leon, Pinellas, St. Lucie, and Taylor counties; and 1 death in Hendry, Lake, Lee, Liberty, Manatee, Nassau, Okeechobee, Pasco, Seminole, St. Johns, and Volusia counties. With Irma making landfall in Monroe County as a Category 4 hurricane, the Florida Keys were hardest hit area in the state. Strong winds and storm surge flooding caused major damage to buildings, trailer parks, boats, roads, the electricity supply, mobile phone coverage, internet access, sanitation, the water supply and the fuel supply throughout the island chain. An estimated 10 ft (3 m) storm surge occurred at Cudjoe Key, where Irma made landfall. Throughout the island, 625 homes sustained minor damage, 52 sustained major damage, and 81 were demolished. On Big Pine Key, one of the most devastated islands, 633 homes received minor impact, 299 homes received major impact, and 473 homes were completely destroyed. Overall in Monroe County, 27,649 homes experienced some degree of damage, including 1,179 homes being destroyed, 2,977 homes receiving major damage, and 5,361 suffering minor damage. Hurricane Irma on September 10, just before landfall on Florida. Hurricane Jose can be seen to the lower right. After devastating the Keys, the storm then struck Collier County as a Category 3 hurricane. Several communities in the county suffered extensive damage, especially along the coast. Throughout the unincorporated areas of the county, 65 homes, including 44 mobile homes, were demolished, while 1,008 homes received major damage. Property damages in unincorporated areas alone reach about $320 million. Lee County was lashed by strong winds and heavy rainfall, which caused prolonged flooding in some areas. More than 24,000 homes suffered some degree of damage, with almost 3,000 homes receiving major damage and 89 homes being destroyed. Damage in the county totaled about $857 million. Impact in much of the Miami metropolitan area was generally limited to extensive tree and fence damage, as well as widespread power outages. However, in Miami-Dade County, about 1,000 homes received major damage and about 50% of crops were lost. Storm surge caused coastal flooding from Homestead to Downtown Miami, as well as in portions of Miami Beach. Parts of the Florida Heartland were devastated by high winds and flooding, particularly Hendry and Highlands counties. Both counties experienced a near-total loss of electricity. In the former, which has most citrus trees of any county in Florida, about 60% of orange crops were lost. Throughout Hendry County, a total of 451 homes had minor damage, 131 homes suffered major damage, and 42 others were destroyed. In Highlands County, 13,138 businesses and homes were damaged to some degree, with 144 being destroyed, 963 sustaining major damage, and 2,408 receiving minor damage. Strong winds and heavy rainfall in Central Florida left some wind damage and extensive flooding, especially in parts of Lake, Orange, Seminole, and Volusia counties, necessitating evacuations and rescues, including more than 200 people in Orlo Vista after hundreds of homes were flooded. A total of 2,999 business or homes were damaged in Lake County, 7,430 in Seminole County, and 3,457 in Volusia County. Additionally, eight tornadoes touched down in Brevard County, all of which caused damage. Along much of the Gulf Coast of Florida, to the north of where Irma made landfall, negative storm surges were observed, with water retracting rather than pushing inland, causing little coastal flooding. However, on the opposite coast, extensive erosion and storm surge flooding occurred in the First Coast, especially in Duval and St. Johns counties. In Duval County, the St. Johns River crested at heights that exceeded records set during Hurricane Dora in 1964. Portions of Jacksonville experienced flooding, particularly the downtown area and the Riverside and San Marco neighborhoods, with about 350 people rescued in those sections of the city. Water reached about 5 ft (1.5 m) high in some homes. The city of Jacksonville suffered about $85 million in damage. In St. Johns County, storm surge left extensive damage to oceanfront properties in Ponte Vedra Beach and Vilano Beach, with several becoming uninhabitable. Additionally, some riverfront businesses in St. Augustine's historic district were flooded due to storm surge from the Matanzas River. In nearby Clay County, rainfall and storm surge combined to cause extensive flooding along portions of the Black Creek and the St. Johns River, with record high crests at several locations along the former. About 350 people and 75 animals were rescued from floodwaters throughout the county. A total of 275 homes were destroyed, 175 were inflicted major damage, and 124 received minor damage. Three deaths were reported in Georgia due to falling trees and debris, along with widespread wind damage and power outages throughout the state primarily due to fallen trees. On Tybee Island, as well as St. Simons Island the storm surge caused extensive flooding. In Charleston, South Carolina, the third highest storm surge on record was recorded, reaching a height of approximately 10 ft (3 m). By of September 12, almost 100,000 had lost power in Upstate South Carolina. Five people died in storm-related incidents across South Carolina, all from indirect incidents. Light damage occurred in other areas, including Tennessee. About 75,000 customers in North Carolina lost power due to Irma. In the immediate aftermath of Hurricane Irma's path through the West Indies and Caribbean, the devastation to roads, harbors and airports significantly impeded the transportation and distribution of relief supplies. Foreign countries moved to provide much of the initial aid. The British, Dutch, French, and United States governments sent warships and planes with supplies and manpower to the region. International leaders, including Dutch King Willem-Alexander and French President Emmanuel Macron, quickly moved to visit affected territories. Some of the affected countries and territories also offered assistance to each other. Cuba, which sustained extensive damage from the storm, sent 750 health workers to Antigua and Barbuda, Saint Kitts and Nevis, Saint Lucia, The Bahamas, Dominica, and Haiti. Government officials and members of the public in Puerto Rico delivered assistance and evacuated people stranded on other islands. The U.S. Citizenship and Immigration Services granted special 30-day humanitarian visas for British Virgin Islanders to stay in Puerto Rico. Hundreds of people stranded on Saint Martin were flown to the Dominican Republic on humanitarian grounds. In response to Hurricane Jose's approach, the Government of Antigua and Barbuda issued a mandatory evacuation on September 9 for any remaining residents on Barbuda. A Miami cargo plane landed on Antigua later that day, carrying over 60 tons (120,000 lbs) of relief supplies for the displaced storm victims—including bottled water, canned food and power generators. RFA Mounts Bay stationed itself near Anguilla and provided support and relief work to the island with its helicopters and 40 marines and army engineers. The ship delivered 6 tonnes of emergency aid to Anguilla and army engineers repaired a fuel leak at Anguilla's main petrol dump, restored power to the island's hospital and provided shelters for those left homeless by the hurricane. The ship arrived in the British Virgin Islands on September 8, 2017 to provide emergency relief to the islands, including providing shelters, food and water. HMS Ocean was diverted from the Mediterranean to provide relief from Gibraltar to the affected British Overseas Territories of Anguilla, British Virgin Islands and Turks and Caicos on September 7, 2017, and aid was also supplied by the Department for International Development from their disaster response centre at Kemble Airfield. As part of a £32 million operation named Operation Ruman, nearly 500 UK military personnel with emergency relief were dispatched from RAF Brize Norton. This included the first deployment of No. 38 Expeditionary Air Wing with 3 RAF aircraft; 2 Airbus A400M Atlas and 1 C130J hercules to support relief efforts. The British government also drafted 2 members of the UK police calibre into the region on September 10, 2017 and 53 police officers were drafted from RAF Brize Norton to the affected British Overseas Territories on September 15, 2017 to help maintain order. UK politicians, including the chairs of the foreign affairs and development select committees, criticized both the government's preparations for the storm and its response as inadequate. By September 12, 2017, the Department for International Development had delivered more than 40 tonnes of aid into the region, including into Turks and Caicos, and 1,000 UK military troops were deployed in the region as part of relief efforts. The Prime Minister of the United Kingdom, Theresa May, pledged an additional £25 million worth of funding as part of relief efforts in the region on September 13, 2017 and the Secretary of State for Foreign and Commonwealth Affairs, Boris Johnson, said that a further 250 UK military personnel would be deployed into the area within the next few days. Anguilla's Chief Minister, Victor Banks, praised the British government's response to the storm and said that Boris Johnson's visit to the island "sends a very positive signal to Anguillans that the British are serious about their response to this very severe hurricane", but went on to say that the current financial commitment from the UK was not substantial enough. By September 15, 2017, the United Kingdom had over 70 military personnel and 4 police officers in Anguilla and had delivered 15 tonnes of aid to the island. In the British Virgin Islands, Royal Marines had cleared the airfield so that it was operational for the delivery of aid into the islands, with more than 200 British military personnel and 54 UK police officers on the ground and 8 tonnes of aid delivered to the islands. 120 British military personnel were on the ground in Turks and Caicos, and over 150 shelter kits and 720 liters of water were delivered to the islands on September 15. Amendments to international aid rules by the Organisation for Economic Co-operation and Development (or OECD) allowed for the UK government to provide access to £13 billion worth of aid to the affected British Overseas Territories, through the UK's Official Development Assistance (ODA) by November 2017. By the afternoon of September 9, Bahamas Power and Light Company had dispatched crews across the archipelago to repair infrastructure damage. The southernmost islands, which were most severely affected by Irma's eye, remained largely inaccessible for days. Assessments showed that 15% of the national telecommunications network had been affected, with at least one tower destroyed. Bahamasair resumed a limited domestic schedule on September 10, with international flights still cancelled due to existing and anticipated destruction at other destinations. The worst devastation occurred on Ragged Island, over which Irma's eye had directly passed. After days of the National Emergency Management Agency not being able to physically reach the island, officials were finally able to inspect it; they promptly declared it uninhabitable. Prime Minister Hubert Minnis said that it was the worst disaster area he or his officials had ever seen, and that all remaining residents would need to leave, potentially permanently. Business leaders and other officials called for a new long-term development model to shift the population away from such sparsely-settled islands. On Grand Bahama and Bimini, where tornadoes associated with Irma touched down on September 10, more than 100 people were left displaced. Infrastructure damage included docks, parks, and the power system. Aside from tangible asset losses, Irma brought significant economic damages. International freight shipping was projected to be offline for a week, and costs for rebuilding supplies were inflated due to demand in the U.S.
Swollen rivers contributed to worsening flooding in the days after the storm system left, resulting in additional evacuations. Officials resorted to using inflatable rafts to access affected areas. The national electrical infrastructure was said to be extensively damaged. In the Dominican Republic, flooding worsened following Irma's departure, leading the number of displaced persons to increase to more than 24,000 by September 8. President Danilo Medina ordered further evacuations due to at-risk dams, while the government banned swimming in rivers and ordered boats kept in port. More than 422,000 people were left without water due to 28 aqueducts being damaged. In Haiti, officials stated that losses were greater than they could have been since people largely did not heed early preparation and evacuation warnings. At least 5,000 homes were flooded. One man died trying to cross a flooded river; another went missing and 17 were injured. The trash- and waste-contaminated floodwaters in places like Cap-Haïtien, Ouanaminthe, and Gonaives led to fears of cholera outbreaks. Flooding continued to worsen days after the storm, as runoff from the mountains swelled rivers in low-lying farming communities. 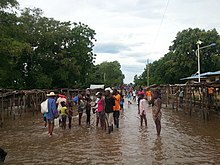 United Nations peacekeepers from Brazil were able to gain access to the flooded northwest region to provide urgent aid, but non-governmental organizations and Haitian economists warned that the estimated 30,000 victims would need longer-term assistance as well. Prime Minister Jack Guy Lafontant appointed a government commission to address Irma's effects, with Action Against Hunger in charge of humanitarian coordination. By September 9, more than one million Puerto Ricans were still without power, tens of thousands were without water, and several thousand were still in shelters. Hospitals were operating on generator power. The government was struggling to establish contact with the islands of Culebra and Vieques. By September 10, the main island had recovered enough to serve as a refuge for people stranded on other islands, including 1,200 tourists from Saint Martin and the U.S. Virgin Islands. Airlifts had brought more than 50 patients to Puerto Rico. Damage to Sint Maarten's harbour and to Princess Juliana International Airport left the Dutch part of Saint Martin unreachable, although the smaller Grand Case-Espérance Airport on the French side could be reopened by September 7 for supply aid by helicopter and airplane. The French armed forces based in Guadeloupe and French Guiana flew equipment and troops on board a CASA/IPTN CN-235 aircraft. The following day, the Dutch military was able to airlift dialysis patients off the island while also dropping leaflets to warn islanders about the rapidly approaching Hurricane Jose. Although the airport was closed, 435 students and faculty of the American University of the Caribbean were evacuated by the U.S. military. On September 10, Dutch King Willem-Alexander departed for the region, with intentions to visit Sint Maarten and other affected Dutch territories and commonwealth members. French President Emmanuel Macron followed this announcement by stating his intentions to visit the French part of the island on September 12 in order to bring aid supplies. In response to criticism of the French handling of the disaster, 1,000 troops, police, and other emergency workers were sent to Saint Martin and Saint Barthélemy. On both sides of Saint Martin, desperate conditions combined with food and water shortages in Irma's aftermath led to reports of violence, scavenging, and theft. In response, the French government increased its troop deployment to 2,200 and the Dutch government sent more than 600 military and police personnel. The day after the hurricane hit Saint Barthelemy the French armed forces based in Guadeloupe and French Guiana flew equipment and troops into the reopened Grand Case-Espérance Airport. On September 7 and 9, equipment and personnel were flown from France to Guadeloupe and Martinique. There were sporadic reports of looting and burglaries at several Miami Metro area businesses with the theft of non-essential items such as sports apparel and athletic shoes during the height of the storm. On September 11, Florida Governor Rick Scott conducted an aerial tour to survey the damage to the Keys. The Overseas Highway remained closed while authorities assessed the integrity of the 42 bridges along the route. Residents returning to the Keys were faced with a police roadblock, to the south of Florida City. USS Iwo Jima, USS New York and aircraft carrier USS Abraham Lincoln were sent to the Keys area to aid with the recovery. On September 12, some residents were allowed to return into the Keys as far as Islamorada. Although road damage blocked entry any farther than Islamorada, bridges had been inspected and found safe to Sugarloaf Key. By late on September 12, the Overseas Highway had been repaired and the bridges inspected as safe for first responders to travel to Key West. On September 16, residents were free to return to Marathon. Residents were allowed to return to Key West the following day, although the Keys remained closed to tourists and a checkpoint remained in place in Florida City. Due mainly to the widespread loss of power, cell phone service was also significantly impacted after battery backup power for cell phone towers ran out and backup generators ran out of fuel. In an impact report by the FCC, as of 11 AM EDT on September 12, 89 of 108 (82%) cell phone towers were non-functioning in Monroe County (Florida Keys), 154 of 212 (73%) were non-functioning in Collier County (Naples), 36 of 46 (78%) were non-functioning in Hendry County, and an additional six counties had 41-60% of cell phone towers not functioning, including Lee County (Fort Myers) and Miami-Dade County. NOAA released map-format aerial reconnaissance image data of damage from the storm. The imagery featured several areas of Florida: including the Florida Keys, the southwest coast of Florida from Marco Island to Punta Gorda, much of the northeast coast of Florida, and portions of the Jacksonville area. Portions of the Georgia and South Carolina coasts were also photographed. Additionally, the Sun-Sentinel published before and after photos of several landmarks in the Florida Keys. In the days after the hurricane, due to the heavy rainfall, numerous rivers had flooded their surrounding land, including residential areas. Public health risks, such as diarrheal infections and mosquito-borne illnesses, remain from the flooding that resulted in the aftermath of the hurricane. A large concern from flooding is contamination because people become exposed to dirty floodwaters and the potential for contaminated water to get into the local water supply is significant. One example of an illness that can get into the water supply is leptospirosis, which is caused by rat urine being in the floodwaters. If people are exposed to leptospirosis and do not get treatment, it can cause kidney damage, meningitis, and liver failure. Noroviruses and other infections are also a risk. Following Irma's passage, a 15 ft (4.6 m) hand-carved wooden canoe was discovered on the banks of the Indian River and could be several hundred years old. The state has removed the canoe for examination and safe keeping. Due to Irma's and Hurricane Harvey's impact in Florida and Texas, the U.S. employment declined in September for the first time since September 2010. The leisure and hospitality industries were especially hard hit, losing 111,000 jobs in the month of September. In the U.S. Virgin Islands, residents and tourists alike were described as being in a state of traumatic shock. By September 7, the USS Wasp amphibious assault ship had arrived in the U.S. Virgin Islands to provide supplies, damage assessment, and evacuation assistance. Four additional warships, some of which had already been on their way to Texas to assist with Hurricane Harvey relief, were redirected to the region. The National Guard was delayed in reaching Saint John due to the number of overturned boats left in the harbor. At a September 10 news conference, Governor Kenneth Mapp described Irma as a "horrific disaster" for which "[t]here will be no restorations or solutions in days or weeks." The Federal Emergency Management Agency airlifted in goods for residents, who were subjected to a curfew. Norwegian Cruise Lines and Royal Caribbean Cruise Line agreed to transport tourists to Florida, contingent upon port availability following the state's own experience with Irma. On Saint John, which was described by The Washington Post as "perhaps the site of Irma's worst devastation on American soil," it took six days for an active-theater disaster zone to be established, leading to criticism of the U.S. government response. The National Guard was brought in to maintain order, while the Coast Guard brought evacuees to cruise ships bound for San Juan and Miami. There was still no electricity on St. John in the middle of October 2017. Irma set multiple records for intensity, especially at easterly longitudes, time spent at such an intensity, and its intensity at landfall. When Irma reached Category 5 intensity with winds of 175 mph (280 km/h) at 11:45 UTC on September 5 at 57.7°W, it became the easternmost Atlantic hurricane of this strength on record, surpassing Hurricane David of 1979. By 00:15 UTC on September 6, Irma reached peak intensity with 180 mph (285 km/h) winds and a minimum pressure of 914 mbar (914 hPa; 27.0 inHg). This ties it with Hurricane Mitch of 1998 and Hurricane Rita of 2005 as the fifth-strongest Atlantic hurricane by wind speed. Only four other Atlantic hurricanes have been recorded with wind speeds higher than Irma: Hurricane Allen of 1980, which had maximum sustained winds of 190 mph (305 km/h), and the 1935 Labor Day hurricane, Hurricane Gilbert of 1988, and Hurricane Wilma of 2005, all of which had peak winds of 185 mph (295 km/h). Upon reaching peak intensity, Irma also became the strongest hurricane ever recorded in the Atlantic Ocean outside the Caribbean Sea and Gulf of Mexico, as well as the strongest Atlantic hurricane since Wilma in terms of maximum sustained winds, and the most intense in terms of pressure since Dean in 2007. In addition, Irma achieved one of the longest durations of Category 5 strength winds, and the third-highest accumulated cyclone energy (ACE) index for a tropical cyclone in the Atlantic basin, with a value of 64.9 units. Only the 1899 San Ciriaco hurricane and Hurricane Ivan in 2004 achieved higher values. On September 6, Irma made landfall on the islands of Barbuda, Saint Martin, and Virgin Gorda at peak strength. This ties Irma with cyclones Monica of 2006 and Winston of 2016, and typhoons Zeb of 1998, Megi of 2010, and Yutu of 2018 as the fifth-strongest tropical cyclone to make landfall globally – in terms of sustained winds – trailing only Typhoon Haiyan of 2013 and Typhoon Meranti of 2016, which bore winds of 190 mph (305 km/h) at landfall, and the 1935 Labor Day hurricane and Typhoon Joan of 1959, which bore winds of 185 mph (295 km/h) at landfall. Irma is second to the 1935 Labor Day hurricane as the strongest landfalling cyclone on record in the Atlantic basin, and is the first hurricane to make landfall anywhere in the Atlantic at Category 5 status since Felix in 2007. Irma is the first recorded Category 5 hurricane to affect the northern Leeward Islands, and was one of the worst storms to hit the region on record, along with Hurricane Donna in 1960 and Hurricane Luis in 1995. In addition, Irma is only the second hurricane on record to make landfall in Cuba at Category 5 intensity, with the other being a hurricane in 1924. Furthermore, when Irma made landfall on Barbuda, Saint Martin, Virgin Gorda, and Cuba as a Category 5 hurricane, it became one of only two recorded Atlantic storms to make landfall in multiple nations at this strength; the other was Hurricane Andrew in 1992, which struck both Eleuthera and the United States as a Category 5 hurricane. Irma made landfall in the Florida Keys with winds of 130 mph (215 km/h) and a pressure of 931 mbar (hPa; 27.49 inHg), making it the strongest hurricane to strike Florida in terms of wind speed since Charley in 2004, and the most intense to strike the state in terms of barometric pressure since Andrew in 1992. In the span of two weeks, two Category 4 hurricanes—Harvey and Irma—struck the continental United States, the first time on record two Atlantic tropical cyclones of such strength made landfall on the country in the same hurricane season. This also marked only the third occurrence of two consecutive Atlantic storms making landfall in the United States as major hurricanes. The other two instances were the Great Charleston and Cheniere Caminada hurricanes in 1893, and hurricanes Ivan and Jeanne in 2004. On April 11, 2018, at the 40th session of the RA IV hurricane committee, the World Meteorological Organization retired the name Irma from its rotating naming lists, due to the extensive amount of damage and loss of life it caused in the northeastern Caribbean and the United States, particularly in Florida, and it will never again be used for another Atlantic hurricane. It will be replaced with Idalia for the 2023 Atlantic hurricane season. 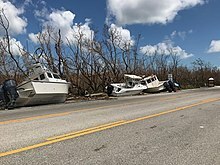 Wikimedia Commons has media related to Hurricane Irma. Hurricane Maria (2017) – attained Category 5 status less than 2 weeks after Irma reached the same intensity, and impacted areas previously affected by Hurricanes Irma and Jose. Hurricane Matthew (2016) – caused damage and deaths in Haiti, before moving to The Bahamas and then skimming the coastline of Florida, before moving up the coast. Hurricane Hugo (1989) – also formed east of the Lesser Antilles, the easternmost known Category 5 hurricane in the Atlantic basin. Hurricane Andrew (1992) – the previous Category 5 hurricane that struck Florida. "Labor Day" (1935) – most intense hurricane to make landfall in the United States. "Okeechobee" (1928) – a hurricane that hit similar areas, for comparing tracking methods and after-effects with those of Hurricane Irma. Hurricane Jose (2017) – a Category 4 hurricane, which formed right behind Irma and also tracked into the Caribbean region. Hurricane Harvey (2017) – a Category 4 hurricane (and the first major one to make landfall in the U.S. in 12 years) which devastated Texas two weeks prior to Irma. Hurricane Luis (1995) – very damaging and powerful hurricane that caused severe impacts in the northern Lesser Antilles. 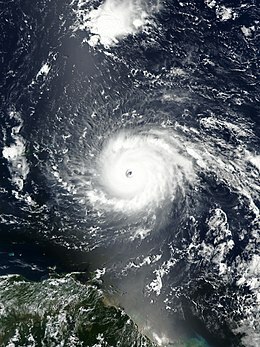 Hurricane Marilyn (1995) – caused destruction as a rapidly intensifying hurricane in the northern Leeward Islands, which had been affected by Luis shortly beforehand. Hurricane Donna (1960) – brushed the Lesser Antilles, before hitting the Florida Keys in early September at Category 4 intensity and travelling up the East Coast of the United States. Hurricane King (1950) – took a similar path up the Florida peninsula after hitting Miami as a Category 4 hurricane. Operation RUMAN – UK military-civil disaster relief response to Hurricane Irma. ^ A major hurricane is a storm that ranks as Category 3 or higher on the Saffir-Simpson hurricane wind scale. ^ a b c d Irma caused 82 indirect and 10 direct deaths in the US, 9 direct deaths in Cuba, 3 direct deaths in the US Virgin Islands, and 3 indirect deaths on Puerto Rico. ^ "Hurricane Irma: Florida assesses damage as storm weakens". BBC. September 11, 2017. Retrieved November 6, 2017. ^ "Irmageddon: Thousands of Miamians Just Had Their First Taste of Hurricane Misery". Miami New Times. September 13, 2017. Retrieved January 25, 2019. ^ Amy Gesenhues (December 13, 2017). "Hurricane Irma was the No. 1 top trending Google search in the US & globally for 2017". Search Engine Land. Retrieved March 25, 2018. ^ Eric S. Blake (August 26, 2017). "Graphical· Tropical Weather Outlook". Miami, Florida: National Hurricane Center. Retrieved August 30, 2017. ^ Eric S. Blake (August 29, 2017). "Graphical Tropical Weather Outlook". Miami, Florida: National Hurricane Center. Retrieved September 4, 2017. ^ a b c d e f g h i j k l m n o p q r s t u v w x y z aa ab ac ad ae af ag ah ai aj ak al am an John P. Cangialosi; Andrew S. Latto; Robbie J. Berg (March 9, 2018). Hurricane Irma (AL112017) (PDF) (Report). Tropical Cyclone Report. National Hurricane Center. Retrieved March 12, 2018. ^ Christopher Landsea (August 30, 2017). Tropical Storm Irma Discussion Number 2 (Report). Miami, Florida: National Hurricane Center. Retrieved September 5, 2017. ^ Eric S. Blake (August 31, 2017). Hurricane Irma Public Advisory Number 6 (Report). Miami, Florida: National Hurricane Center. Retrieved August 31, 2017. ^ John P. Cangialosi (September 2, 2017). "Hurricane Irma Discussion Number 12". National Hurricane Center. Retrieved September 5, 2017. ^ "Ship Status Report: callsign BATFR17". sailwx.info. Mobile Geographics LLC. September 5, 2017. Archived from the original on September 5, 2017. Retrieved September 5, 2017. ^ Daniel P. Brown (September 3, 2017). "Hurricane Irma Discussion Number 17". National Hurricane Center. Retrieved September 5, 2017. ^ Richard J. Pasch (September 3, 2017). "Hurricane Irma Discussion Number 19". National Hurricane Center. Retrieved September 5, 2017. ^ Jack L. Beven II (September 9, 2017). "Hurricane Irma Advisory Number 45". National Hurricane Center. Retrieved March 18, 2018. ^ Richard J. Pasch (September 11, 2017). "Tropical Storm Irma Discussion Number 50". National Hurricane Center. Retrieved March 19, 2018. ^ Rebecca Savaransky (September 4, 2017). "Florida governor declares state of emergency over Hurricane Irma". The Hill. Retrieved September 4, 2017. ^ Michael Biesecker and Andrew Taylor (September 6, 2017). "FEMA still focused on responding to Harvey with dwindling cash as Irma looms". The Chicago Tribune. Retrieved September 10, 2017. ^ "Disaster Coordinator: Barbuda ready and prepared for the passage of Hurricane Irma". The Daily Observer. September 5, 2017. Retrieved September 6, 2017. ^ a b "Hurricane Irma: Storm Leaves Major Damage on Some Islands". The New York Times. September 6, 2017. Retrieved September 6, 2017. ^ "PM says relief efforts are already underway for A&B". The Daily Observer. September 5, 2017. Retrieved September 6, 2017. ^ "Comment la Guadeloupe, Saint-Barth et Saint-Martin se préparent à l'ouragan Irma" [How Guadeloupe, Saint-Barth and Saint-Martin prepare for Hurricane Irma] (in French). 20 minutes. Agence France-Presse. September 4, 2017. Retrieved September 4, 2017. ^ "Irma. Un ouragan aussi fort qu'Harvey attendu dans les Caraïbes" [Irma. Hurricane as strong as Harvey expected in the Caribbean]. Ouest France (in French). Agence France-Presse. September 4, 2017. Retrieved September 5, 2017. ^ a b Préfet de Guadeloupe [@Prefet971] (September 6, 2017). "Passage de l'ouragan IRMA en #Guadeloupe. Point de situation, ce mercredi 6 sept. à 5h" (Tweet) – via Twitter. ^ "The Latest: Hurricane upends Delaware couple's celebration". National Post. September 13, 2017. Retrieved September 13, 2017. ^ "Le dangereux Ouragan Irma se rapproche des Antilles" [The dangerous Hurricane Irma gets closer to the West Indies] (in French). franceinfo. September 4, 2017. Retrieved September 4, 2017. ^ Peggy Pinel-Fereol (September 5, 2017). "La Martinique envoie des renforts en Guadeloupe, Saint-Barthélemy et Saint-Martin" [Martinique sends reinforcements to Guadeloupe, Saint-Barthélemy and Saint-Martin] (in French). France Télévisions. Retrieved September 7, 2017. ^ "Hurricane Irma approaches Northern Leeward Islands". St. Lucia Times. September 4, 2017. Retrieved September 4, 2017. ^ "Tropical Storm Watch remains in effect for Dominica". Dominica News Online. September 4, 2017. Retrieved September 4, 2017. ^ "Turks and Caicos Islands residents told not to take Hurricane Irma lightly". The Turks and Caicos Sun. September 5, 2017. Retrieved September 8, 2017. ^ "Hurricane Irma doesn't have to be a disaster says TCI's Disaster Management director". The Turks and Caicos Sun. September 5, 2017. Retrieved September 8, 2017. ^ "Hurricane Irma in the Dominican Republic". International Charter Space & Major Disasters. September 5, 2017. Archived from the original on September 7, 2017. Retrieved September 6, 2017. ^ "Hurricane Irma in the United States". International Charter Space & Major Disasters. September 7, 2017. Retrieved September 11, 2017. ^ "Irma in Haiti". International Charter Space & Major Disasters. September 7, 2017. Retrieved September 11, 2017. ^ a b c "Jamaica trying to determine severity of Irma's impact on Caribbean neighbours". The Jamaica Observer. September 8, 2017. Retrieved September 10, 2017. ^ a b c d e "Hurricane Irma wreaks apocalyptic damage in the Caribbean". The New Orleans Times-Picayune. September 7, 2017. Retrieved September 8, 2017. ^ a b c d "Irma's destruction: island by island". The Guardian. September 9, 2017. Retrieved September 10, 2017. ^ Jacqueline Charles (September 8, 2017). "Vulnerable Haiti escapes worst of Hurricane Irma but flooding risks continue". The Miami Herald. Retrieved September 7, 2017. ^ Randy Smith (September 8, 2017). "National sporting facilities prepared for Irma". The Nassau Guardian. Retrieved September 8, 2017. ^ "PM Warns: Stay Indoors And Heed All Warnings". The Nassau Tribune. September 8, 2017. Retrieved September 8, 2017. ^ Sloan Smith (September 8, 2017). "Power, water supply on NP to remain on 'as long as possible'". The Nassau Guardian. Retrieved September 8, 2017. ^ "Prepare Kit To Bring To Shelters". The Nassau Tribune. September 8, 2017. Retrieved September 8, 2017. ^ "Atlantis Open To 1,200 Guests During Irma". The Nassau Tribune. September 8, 2017. Retrieved September 8, 2017. ^ a b c d e "Hurricane Irma Live Updates: 'The Storm Is Here,' Florida Governor Says". The New York Times. Retrieved September 9, 2017. ^ "Taken in Camagüey for protection of fuels". Radio Cadena Agramonte. September 8, 2017. Retrieved September 9, 2017. ^ "Cuba prepares for destructive power of Hurricane Irma". CBS News. September 8, 2017. Retrieved September 9, 2017. ^ a b c d e f Select Committee on Hurricane Response and Preparedness Final Report (PDF) (Report). Florida House of Representatives. January 16, 2018. pp. 1–5. Retrieved January 19, 2018. ^ Lance Dixon; David J. Neal; Jane Woolridge (September 4, 2017). "How South Florida is gearing up for the storm". Miami Herald. Retrieved September 5, 2017. ^ a b c d e f "Gov. Scott Issues Updates on Hurricane Irma Preparedness". Office of Governor Rick Scott. September 9, 2017. Retrieved January 12, 2018. ^ a b c d e f g "Storm Data and Unusual Weather Phenomena" (PDF). Storm Data. Asheville, North Carolina: National Climatic Data Center. 59 (9). September 2017. ISSN 0039-1972. Archived (PDF) from the original on March 5, 2018. Retrieved March 5, 2018. ^ Ben Mutzabaugh (September 11, 2017). "Hurricane Irma: Flight cancellations top 12,500; even more expected". USA Today. Retrieved January 12, 2018. ^ Dewayne Bevil (September 8, 2017). "Hurricane Irma forces Disney, Universal, SeaWorld closings in Orlando". Orlando Sentinel. Retrieved September 8, 2017. ^ Anna Heiney (September 25, 2017). "Kennedy Space Center Safely Weathers Hurricane Irma". National Aeronautics and Space Administration. Retrieved January 23, 2018. ^ "Gov. Scott Issues Updates on Hurricane Irma Preparedness". Office of Governor Rick Scott. September 7, 2017. Retrieved September 10, 2017. ^ Wayne Roustan (May 26, 2017). "State introducing new hurricane evacuation plan this year". Sun-Sentinel. Retrieved September 10, 2017. ^ Wayne Roustan (September 9, 2017). "Hurricane Irma: I-4 shoulder opened to Tampa evacuees". Sun-Sentinel. Retrieved September 10, 2017. ^ Michael Biesecker; Jason Dearen (September 9, 2017). "Flooding threatens toxic waste sites as Hurricane Irma nears". The Hartford Courant. Retrieved September 11, 2017. ^ "Hurricane Irma". Direct Relief. September 11, 2017. Retrieved March 27, 2019. ^ Lauren Foreman; Ellen Eldridge. "Hurricane Irma: 30 Georgia counties under state of emergency". The Atlanta Journal-Constitution. Retrieved September 7, 2017. ^ Kristina Torres. "Hurricane Irma: Georgia Gov. Nathan Deal extends state of emergency to 64 more counties". The Atlanta Journal-Constitution. Retrieved September 9, 2017. ^ a b c "Cuba lashed by category five winds as storm heads to US – as it happened". The Guardian. Retrieved September 9, 2017. ^ Meris Lutz. "Hurricane Irma: Gov. Deal expands state of emergency to all Georgia". The Atlanta Journal-Constitution. Retrieved September 10, 2017. ^ Scott Unger; Patricia Sullivan; David A. Fahrenthold (September 10, 2017). "Hurricane Irma packs a double punch". The Hartford Courant. Retrieved September 10, 2017. ^ a b "Talladega Superspeedway, Atlanta Motor Speedway offer free campground space for Irma evacuees". WHNT News 19. September 6, 2017. Retrieved September 8, 2017. ^ "Tolls to be suspended on I-75 express lanes south of Atlanta". CBS46. Retrieved September 8, 2017. ^ Josh Shaffer; Abbie Bennett (September 6, 2017). "NC governor declares state of emergency ahead of 'powerful' Hurricane Irma: 'Get ready'". The News & Observer. Retrieved September 6, 2017. ^ Elizabeth Townsend (September 6, 2017). "Hurricane Irma: SC Governor McMaster declares state of emergency". The Sun News. Retrieved September 6, 2017. ^ Scott Wise (September 8, 2017). "Virginia Governor declares state of emergency ahead of Hurricane Irma". Richmond, Virginia: WTVR-TV. Retrieved September 8, 2017. ^ a b Staff (September 8, 2017). "Bristol Motor Speedway campground open to Irma evacuees". Bristol, VA: WCYB-TV. Retrieved September 11, 2018. ^ Paul Murphy (September 5, 2017). "Louisiana planning for possible impacts from Hurricane Irma". WWL-TV. Retrieved September 9, 2017. ^ "TN Gov. Bill Haslam issues executive order for Irma evacuees". News 9 ABC News. September 10, 2017. Retrieved September 11, 2017. ^ a b Kevin Spain. "How Hurricane Irma is affecting sports this weekend". USA Today. Retrieved January 15, 2018. ^ John Reid (September 13, 2017). "Jaguars dealing with aftermath of Hurricane Irma while preparing for Titans". Florida Times-Union. Retrieved January 15, 2018. ^ Marc Lancaster (September 5, 2017). "Florida State League cancels championship series as Hurricane Irma looms". Sporting News. Retrieved September 6, 2017. ^ "Carolina League cancels Mills Cup Finals". Carolina League. ^ "Southern League Championship Series canceled". Minor League Baseball. ^ "The Miami FC vs. San Francisco Deltas Match Postponed". Miami FC. September 6, 2017. Retrieved January 23, 2018. ^ Iliana Limón Romero (September 6, 2017). "Hurricane Irma moves Orlando Pride, Seattle Reign match to Thursday". Orlando Sentinel. Retrieved September 10, 2017. ^ Alicia DelGallo (September 7, 2017). "Hurricane Irma could strand Orlando City in Washington D.C." Orlando Sentinel. Retrieved September 10, 2017. ^ Mike Lowe (September 14, 2017). "UMaine football game vs. Central Florida canceled". Portland Press Herald. Retrieved January 15, 2018. ^ Chip Patterson; Ton Fornelli (September 8, 2017). "Hurricane Irma: Florida, Florida State, Miami among teams to cancel games". CBS Sports. Retrieved January 15, 2018. ^ Kevin Kelley (September 6, 2017). "Alcorn State at FIU football game moved to Birmingham's Legion Field". FBSchedules.com. Retrieved January 23, 2018. ^ "Game Alert: Georgia Southern/New Hampshire Football Game Moved to Birmingham". Georgia Southern Athletics. September 6, 2017. Retrieved September 8, 2017. ^ Erik Wasson; Christopher Flavelle (September 5, 2017). "FEMA Is Almost Out of Money and Hurricane Irma Is Approaching". Bloomberg News. Retrieved September 5, 2017 – via www.bloomberg.com. ^ Thomas Kaplan (September 7, 2017). "Senate Votes to Raise Debt Limit and Approves $15 Billion in Hurricane Relief". The New York Times. ISSN 0362-4331. Retrieved September 8, 2017. ^ a b c d e f James Daniell; Bernhard Mühr; Antonios Pomonis; Andreas Schäfer; Susanna Mohr. Hurricane Irma: Report No. 1, Focus on Caribbean up until 8th September 2017 (PDF) (Report). Center for Disaster Management and Risk Reduction Technology. Archived from the original (PDF) on September 9, 2017. Retrieved September 9, 2017. ^ a b Neil Hartnell (January 19, 2018). "Bahamas Facing $500m Storm Bill Over Next Decade". Tribune 242. Retrieved February 13, 2018. ^ Samuel Oakford (November 24, 2017). "Recovery pledges for hurricane-ravaged Caribbean are a drop in the ocean". IRIN. Retrieved November 29, 2017. ^ a b c (now), Alan Yuhas; Weait, Matthew; Farrer, Martin; (earlier), and Martin Pengelly (September 11, 2017). "Hurricane Irma: 10 dead in Cuba as record flooding hits northern Florida – latest updates". The Guardian. ^ a b c Cuba: Hurricane Irma - Three Month Report (PDF) (Report). ReliefWeb. United Nations. December 15, 2017. Retrieved January 26, 2017. ^ Michelle Kaske and Alexander Lopez (September 19, 2017). "Puerto Rico Faces Hurricane Maria After Irma's $1 Billion Damage". Bloomberg. Retrieved September 19, 2017. ^ Angela H. Cutrer (September 15, 2017). "Hurricane Irma leaves St. Kitts and Nevis with initial $53.2 million in damages". St. Kitts & Nevis Observer. Retrieved September 18, 2017. ^ a b "IRMA, des dégâts évalués à 3,5 milliards". ^ "BREAKING: Dutch Prime Minister Mark Rutte says the death toll on St. Maarten has risen to four after Hurricane Irma". Associated Press. September 10, 2017 – via Twitter. ^ Rebecca Harrington (September 12, 2017). "Florida and the Caribbean dig out of Hurricane Irma's devastation and begin a slow and costly recovery". The Guardian. Retrieved September 13, 2017. ^ Claire Phipps; Alan Yuhas; Matthew Weaver. "Hurricane Irma: Florida braces for epic storm as Caribbean death toll hits 23 – latest updates". The Guardian. Retrieved September 8, 2017. ^ "PM says relief efforts are already underway for A&B". The Daily Observer. Hurricane Irma Updates. September 6, 2017. Retrieved September 6, 2017. ^ Ann M. Simmons (September 7, 2017). "Once there was an island known as Barbuda. After Hurricane Irma, much of it is gone". Los Angeles Times. Retrieved September 7, 2017. ^ Kirk Semple; Carl Joseph (September 6, 2017). "Hurricane Irma: 'We Will Have Victims to Lament'". The New York Times. Barbuda is devastated, but Antigua is spared. ISSN 0362-4331. Retrieved September 6, 2017. ^ Blair Shiff (September 6, 2017). "Hurricane Irma destroys 90 percent of structures, vehicles on Barbuda". ABC News. Retrieved September 6, 2017. ^ a b c Lewis, Emma; Sutton, Ann. "After the Storm". BirdsCaribbean. 2017-09-11. Retrieved September 18, 2017. ^ "Hurricane Irma – In Pictures [Antigua]". Antigua Observer. September 7, 2017. Retrieved September 7, 2017. ^ "Antigua spared the worst during passage of Hurricane Irma". Dominica News Online. September 6, 2017. Retrieved September 6, 2017. ^ Abigail O'Leary (September 6, 2017). "Trail of devastation as Hurricane Irma destroys whole Caribbean island of Saint Martin". Mirror. Retrieved September 6, 2017. ^ a b Joe Barnes (September 7, 2017). "Hurricane Irma damage update: Shocking extent of St Martin damage". Daily Express. Retrieved September 7, 2017. ^ "'C'est un cauchemar' raconte notre journaliste à Saint-Martin" ['It's a nightmare' says our reporter in Saint-Martin]. France Télévisions (in French). September 6, 2017. Archived from the original on September 6, 2017. Retrieved September 6, 2017. ^ "Irma sème 'l'apocalypse' à Saint-Barth et Saint-Martin, au moins 4 morts" [Irma sows 'apocalypse' in Saint-Barth and Saint-Martin, at least 4 dead]. La Croix (in French). Agence France-Presse. September 7, 2017. Retrieved September 7, 2017. ^ a b "Dode en plunderingen op Nederlandse deel Sint Maarten na orkaan Irma" [Dead and looting on Dutch part of Sint Maarten after Hurricane Irma] (in Dutch). Nu. September 8, 2017. Retrieved September 8, 2017. ^ Rachel Bishop (September 6, 2017). "World famous Princess Juliana St Maarten Airport where planes fly just above tourists' heads devastated by Hurricane Irma". Mirror. Retrieved September 6, 2017. ^ "The Latest: States sending 7K National Guardsmen to Florida". ABC News. Associated Press. September 9, 2017. Retrieved September 9, 2017. ^ "Dit is wat we nu weten over de gevolgen van orkaan Irma". Het Parool (in Dutch). September 8, 2017. Retrieved September 8, 2017. ^ "Premier Sint-Maarten: 'We hebben zeker een miljard nodig'" [Prime Minister of St. Maarten: "We definitely need a billion"] (in Dutch). NOS. September 8, 2017. Retrieved September 9, 2017. ^ "Dutch government: 4 Irma deaths on St. Maarten". WJLA. Associated Press. Retrieved September 10, 2017. ^ a b "Ouragan Irma : 'A Saint-Barthélemy, on a été rayés de la carte'" [Hurricane Irma: 'In Saint-Barthélemy, we were wiped off the map']. Le Monde (in French). September 7, 2017. Retrieved September 7, 2017. ^ a b "Irma : à Saint-Barthélémy, "l'île est vraiment anéantie", témoigne une habitante". Le Parisien. September 7, 2017. Retrieved September 7, 2017. ^ Laura Smith-Spark; Marilia Brocchetto (September 6, 2017). "Deaths reported as Hurricane Irma batters northern Caribbean islands". CNN. Retrieved September 6, 2017. ^ "Ouragan Irma : CCR évalue à environ 1,2 milliard d'euros le coût des dommages assurés pour les îles de Saint-Martin et Saint-Barthélemy" [Hurricane Irma: CCR estimates the cost of insured losses for the islands of Saint-Martin and Saint-Barthélemy at around 1.2 billion euros] (Press release) (in French). France: Caisse Centrale de Réassurance. September 9, 2017. Retrieved September 9, 2017. ^ Jeff Masters (January 30, 2018). "A 199 mph Wind Gust in Irma: a Personal Weather Station Record". Weather Underground. Retrieved January 30, 2018. ^ a b c d e Hurricane Irma: Situation Report 2 (PDF) (Report). Humanity Road. September 7, 2017. TC-2017-000125-DOM. Retrieved September 8, 2017. ^ Eastern Caribbean: Humanitarian Situation Report #1 (PDF). ReliefWeb (Report). UNICEF. September 6, 2017. Retrieved September 8, 2017. ^ "Sea swells dump debris at Castries Waterfront". St. Lucia Times. September 5, 2017. Retrieved September 5, 2017. ^ "Young surfer's death comes as a shock". Barbados Today. September 5, 2017. Retrieved September 5, 2017. ^ Alexandra Wilts (September 6, 2017). "Hurricane Irma has become so strong it's showing up on seismometers used to measure earthquakes". Independent. Retrieved September 6, 2017. ^ Americas: Hurricane Irma (PDF) (Information Bulletin). International Federation of Red Cross and Red Crescent Societies. September 6, 2017. pp. 2–3. Retrieved September 7, 2017. ^ a b "Saba Government on Facebook: no deaths have been reported on Saba". Saba-News. September 6, 2017. Retrieved September 9, 2017. ^ Kathryn Hansen (September 11, 2017). "Hurricane Irma Turns Caribbean Islands Brown". NASA Earth Observatory. Retrieved September 12, 2017. ^ Ciara Linnane. "President Trump's and Richard Branson's Caribbean homes destroyed by Hurricane Irma". MarketWatch. Retrieved September 7, 2017. ^ Ferre-Sadurn, Luis (September 16, 2017). "CBritish Virgin Islands: 'Knocked Down, but Not Knocked Out' by Irma". New York Times. Retrieved September 19, 2017. ^ "Hurricane Irma: UK territory declares state of emergency". BBC News. September 8, 2017. Retrieved October 4, 2017. ^ "98% of electricity now restored in BVI". BVI News. February 21, 2018. Retrieved April 12, 2018. ^ "News of St. John". Facebook. ^ "Former Nashville family says St. John residents desperate after Irma, pleads for help". Fox17. ^ "St. John resident says there were 'houses flying away' when Irma hit". Boston Globe. September 8, 2017. ^ "Red Cross Establishes Helpline For Family Reunification; Ferry Service Between St. Thomas And St. John To Resume Soon". The Virgin Islands Consortium. ^ "Hurricane Irma Spreading Damaging Winds into Georgia; Surge and Rainfall Flooding from Florida to South Carolina". The Weather Channel. September 11, 2017. Archived from the original on September 11, 2017. Retrieved September 11, 2017. ^ a b c Cindy Burgos Alvarado (September 17, 2017). "Wrap-up of damages in P.R. caused by Hurricane Irma". Casiano Communications. Retrieved April 21, 2019. ^ Luis Ferré-Sadurní (September 10, 2017). "Irma Grazes Puerto Rico but Lays Bare an Infrastructure Problem". The New York Times. Retrieved September 10, 2017. ^ Housing Damage Assessment and Recovery Strategies Report Puerto Rico (PDF) (Report). United States Department of Housing and Urban Development. June 29, 2018. p. 19. Retrieved April 21, 2019. ^ Storm Events Database (Report). National Climatic Data Center. 2017. Retrieved April 21, 2019. ^ Leysa Caro González. "Reportan cuatro muertes que podrían asociarse a Irma". Primera Hora (in Spanish). Retrieved September 7, 2017. ^ a b c "Hurricane Irma: Haiti and Dominican Republic facing "the day after" cleaning up and rebuilding". Oxfam. September 8, 2017. Retrieved September 8, 2017. ^ a b "Irma mostly spared Haiti. But for struggling farmers, the damages are devastating". The Miami Herald. September 9, 2017. Retrieved September 9, 2017. ^ "Extensive flooding, damage in Turks and Caicos". The Nassau Guardian. September 8, 2017. ISSN 0261-3077. Archived from the original on September 9, 2017. Retrieved September 8, 2017. ^ "Bahamians in TCI recall Irma nightmare". The Nassau Guardian. September 12, 2017. Retrieved September 13, 2017. ^ "Bahamas escapes worst of Irma". The Nassau Guardian. September 8, 2017. Retrieved September 8, 2017. ^ "BPL Gives Update on Southern Islands". The Nassau Tribune. September 8, 2017. Retrieved September 8, 2017. ^ "Reports of Hurricane Damage To Morton Salt Compound". The Nassau Tribune. September 8, 2017. Retrieved September 8, 2017. 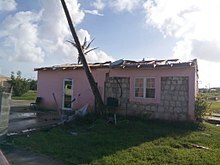 ^ "Tornadic Activity Damages Homes in Grand Bahama". The Nassau Tribune. September 10, 2017. Retrieved September 10, 2017. ^ a b "More than 100 people displaced by tornadoes". The Nassau Guardian. September 12, 2017. Retrieved September 12, 2017. ^ Calfas, Jennifer (September 10, 2017). "Hurricane Irma Is So Powerful it Sucked Ocean Water Away in the Bahamas". TIME. Retrieved January 20, 2017. ^ Staff, Writer (September 19, 2017). "Dominican Navy ship arrives in Cuba with aid for victims of Hurricane Irma". RadioCiudad. ACN/imop. Retrieved September 26, 2017. ^ a b c Anthony Faiola (September 10, 2017). "'People are roaming like zombies.' Virgin Islands stagger after storm passes". The Washington Post. Retrieved September 10, 2017. ^ Linthicum, Kate. "Cuba took a direct hit from Hurricane Irma — and may have spared Florida from worse damage". Los Angeles Times. 2017-09-11. Retrieved September 18, 2017. ^ "Sand Disturbed by the Passing of Hurricane Irma". NOAA. September 13, 2017. Retrieved September 23, 2017. ^ Andres Viglucci; Carli Teproff; Daniel Chang (September 11, 2017). "Irma could have been a lot worse for South Florida, but it's still not a pretty picture". Miami Herald. Retrieved September 12, 2017. ^ Donald J. Trump (September 12, 2017). "The devastation left by Hurricane Irma was far greater, at least in certain locations, than anyone thought – but amazing people working hard!". Retrieved September 14, 2017 – via Twitter. ^ a b c d e f "Hurricane Irma Hits South Florida". Tropical Winds Newsletter (Report). National Weather Service Miami, Florida. Fall 2017. Retrieved January 9, 2018. ^ a b c Jon Rizzo; Matt Moreland (September 23, 2017). Post Tropical Cyclone Report...Hurricane Irma...Updated (PDF) (Report). National Weather Service Key West, Florida. Retrieved November 23, 2017. ^ Hurricane Irma – Power Outage Data (PDF) (Report). Florida Division of Emergency Management. September 11, 2017. Retrieved January 9, 2018. ^ Bernie Woodall. "With 7.4 million without power, utility workers get respect". Reuters. Retrieved January 19, 2018. ^ a b c d e "Irma death toll up to 69 in Florida". WJXT. News Service of Florida. October 6, 2017. Retrieved January 4, 2018. ^ "Hurricane Irma's death toll rises; First storm-related Florida death reported". WJLA. Associated Press. September 8, 2017. Retrieved January 25, 2018. ^ Gwen Filosa (September 21, 2017). "Hurricane Irma-related deaths rise to 14 in Florida Keys". Miami Herald. Retrieved November 24, 2017. ^ Brett Murphy; Joseph Canney (September 17, 2017). "After a death in Everglades City, rising concerns of a public health crisis". Naples Daily News. Retrieved December 2, 2017. ^ Event Details: Tropical Storm (Report). National Climatic Data Center. 2017. Retrieved December 19, 2017. ^ Max Jaeger (September 11, 2017). "Florida Keys in crisis as state cleans up after Irma". New York Post. Retrieved September 14, 2017. ^ Jason Samenow; Greg Porter. "Hurricane Irma battering Florida Peninsula, with 'catastrophic' storm surge feared". Washington Post. Retrieved September 10, 2017. ^ Approximate Damage Assessment Results (Report). Monroe County, Florida, Government. November 26, 2017. Retrieved January 8, 2018. ^ Greg Stanley (September 26, 2017). "Collier County tallies $320M of estimated damage from Hurricane Irma". Naples Daily News. Retrieved December 2, 2017. ^ Chad Gillis (September 11, 2017). "Top forecaster: 'Nothing' about Irma was expected". USA Today. Retrieved December 4, 2017. ^ Quincy J. Walters (September 28, 2017). "Bonita Springs Still Contending With Flooding Weeks After Irma". WGCU. Retrieved December 5, 2017. ^ Bill Smith (September 29, 2017). "Hurricane Irma damage toll in Lee County: $742 million and rising". The News-Press. Retrieved December 4, 2017. ^ Pamela McCabe (October 6, 2017). "Lee County schools estimates Hurricane Irma damage at $21 million". The News-Press. Retrieved December 4, 2017. ^ "Highlands Co: 98 percent without power, roads blocked". WFLA. September 11, 2017. Retrieved December 21, 2017. ^ Gabrielle Ware (September 12, 2017). "Irma Leaves Behind Major Crop Damage For Florida Farmers". WMAR-TV. Retrieved September 26, 2017. ^ Martin E. Comas (September 29, 2017). "Hurricane Irma flooding woes continue in Seminole and Astor three weeks after massive storm". Orlando Sentinel. Retrieved February 10, 2018. ^ Event Details: Flood (Report). National Climatic Data Center. 2017. Retrieved January 10, 2018. ^ Jerry Fallstrom (December 26, 2017). "Damage tally for Astor tops $438K, property appraiser says". Orlando Sentinel. Retrieved January 11, 2018. ^ Hurricane Irma: September 10-11, 2017, Post Storm Summary (PDF) (Report). National Weather Service Melbourne, Florida. September 29, 2017. Retrieved December 19, 2017. ^ a b Post Tropical Cyclone Report...Hurricane Irma (Report). National Weather Service Jacksonville, Florida. September 23, 2017. Retrieved February 8, 2018. ^ David Bauerlein (December 16, 2017). "City expects $85 million tab for Irma-related costs". The Florida Times-Union. Archived from the original on December 16, 2017. Retrieved January 5, 2018. ^ "Photos: Ponte Vedra oceanfront homes hit hard by Irma". The Florida Times Union. September 11, 2017. Archived from the original on September 14, 2017. Retrieved December 31, 2017. ^ Shelby Danielsen (September 13, 2017). "Vilano Beach homes torn apart by Irma, worsened by severe erosion". WJXX. Retrieved December 31, 2017. ^ Ryan Benk (September 15, 2017). "Some Downtown St. Augustine Businesses Forced To Start Over After Irma". WJCT. Retrieved December 31, 2017. ^ Teresa Stepzinski (September 26, 2017). "Storm surge damage from Hurricane Irma forces Orange Park condo owners from homes". The Florida Times Union. Archived from the original on January 25, 2018. Retrieved January 2, 2018. ^ Jonathan Landrum Jr.; Russ Bynum (September 11, 2017). "Irma whips Southeast: 3 dead in Georgia, 1 in South Carolina". ABC News. Archived from the original on September 12, 2017. Retrieved September 12, 2017. ^ "Tropical Storm Irma kills at least 2 in Georgia". CBS News. September 11, 2017. Retrieved September 12, 2017. ^ "Widespread damage across south Georgia from Irma". WSBTV. September 13, 2017. Retrieved July 18, 2018. ^ "Irma causes severe flooding, power outages in South Carolina". CBS News. September 11, 2017. Retrieved September 12, 2017. ^ "Outage update: About 33,500 still without power in Upstate". Greenville News. September 13, 2017. Retrieved September 13, 2017. ^ "S.C.'s Irma death total climbs to 5, as man hurt in wreck succumbs to injuries". ABC News 4. Associated Press. September 28, 2017. Retrieved October 3, 2017. ^ "Irma remnants bringing rain, windy conditions to Nashville area". The Tennessean. Retrieved September 13, 2017. ^ "About 45,000 without power after Irma blows through parts of NC". WRAL. Retrieved September 13, 2017. ^ a b "US warships begin Hurricane Irma relief operations". CNN. September 7, 2017. Retrieved September 10, 2017. ^ a b "Dutch King heads to Caribbean to support post-hurricane efforts". The Jamaica Observer. September 9, 2017. Retrieved September 10, 2017. ^ a b "The Latest: French leader to go to hurricane-hit St. Martin". Fox News Channel. September 10, 2017. Retrieved September 10, 2017. ^ "Irma: Cuba sends hundreds of doctors to Caribbean islands devastated by hurricane". The Independent. September 9, 2017. Retrieved September 10, 2017. ^ a b Luis Ferré-Sadurní (September 10, 2017). "Spared Irma's Worst, Puerto Ricans Sail to Virgin Islanders' Aid". The New York Times. Retrieved September 10, 2017. ^ "PAWA Dominicana flight will bring storm victims from Saint Maarten". Dominican Today. September 12, 2017. Retrieved September 12, 2017. ^ "Government's Hurricane relief for Barbuda begin arriving on Antigua Friday". Antigua Observer. September 9, 2017. Retrieved September 9, 2017. ^ Kate Proctor; Fiona Simpson (September 7, 2017). "Hurricane Irma: Queen sends message of support to Caribbean as Navy rush to aid of those caught up in deadly storm". Evening Standard. Retrieved September 7, 2017. ^ a b "RFA Mounts Bay delivers vital aid to Caribbean islands". Government of the United Kingdom. September 8, 2017. Retrieved September 10, 2017. ^ a b "Hurricane Irma update: UK continues to urgently deliver vital aid to the victims of Hurricane Irma". Government of the United Kingdom. September 12, 2017. Retrieved September 13, 2017. ^ "Hurricane Irma: UK increases relief fund to £32m". BBC. September 7, 2017. Retrieved September 10, 2017. ^ "Hurricane Irma: Millions told to evacuate in Florida as storm batters Cuba". ITV. September 9, 2017. Retrieved September 10, 2017. ^ "Hurricane Irma: UK Royal Marines take aid to victims". BBC. September 9, 2017. Retrieved September 10, 2017. ^ "Hurricane Irma: UK government actions update, 10 September 2017". Government of the United Kingdom. September 10, 2017. Retrieved September 11, 2017. ^ a b Azam Ahmed; Kirk Semple (September 10, 2017). "Violence Erupts on Desperate Caribbean Islands: 'All the Food Is Gone'". The New York Times. Retrieved September 10, 2017. ^ Jamie Doward; Toby Helm (September 9, 2017). "Britain 'not doing enough' to help its Caribbean territories". The Guardian. Retrieved September 10, 2017. ^ a b "Hurricane Irma: Boris Johnson sees impact on Caribbean". BBC. September 13, 2017. Retrieved September 13, 2017. ^ Press Association in Anguilla (September 13, 2017). "Boris Johnson arrives in Anguilla after 'absolutely hellish' Hurricane Irma". The Guardian. Retrieved September 13, 2017. ^ a b c "Hurricane Irma: UK government response in numbers, 15 September 2017". Government of the United Kingdom. September 15, 2017. Retrieved September 16, 2017. ^ "TCI to benefit from UK's £13 billion relief fund". November 6, 2017. Retrieved November 6, 2017. ^ "BPL working to restore electricity supply". The Nassau Guardian. September 9, 2017. Retrieved September 9, 2017. ^ "BTC: 15% of network gets Irma impact". The Nassau Tribune. September 12, 2017. Retrieved September 12, 2017. ^ "Hurricane Irma: All Clear For New Providence, Abaco, Berry Islands, Eleuthera; Hurricane Warnings Remain For Andros, Bimini, Grand Bahama". The Nassau Tribune. September 9, 2017. Retrieved September 9, 2017. ^ a b "Significant damage on Ragged Island". The Nassau Guardian. September 9, 2017. Retrieved September 9, 2017. ^ "Unlivable; Ragged Is. residents to be moved". The Nassau Guardian. September 12, 2017. Retrieved September 12, 2017. ^ "Ragged Islanders tell of Irma's fury". The Nassau Guardian. September 12, 2017. Retrieved September 12, 2017. ^ "Small Family Islands Model 'Unsustainable'". The Nassau Tribune. September 12, 2017. Retrieved September 12, 2017. ^ "Businesses Face 'Major Supply Chain Disruption'". The Nassau Tribune. September 8, 2017. Retrieved September 8, 2017. ^ "Thousands in shelters; towns cut off as downpours, flooding continue". Dominican Today. September 8, 2017. Retrieved September 11, 2017. ^ "28 aqueducts damaged, over 422,000 people without piped water". Dominican Today. September 11, 2017. Retrieved September 12, 2017. ^ "Dominican, Haitian authorities scramble to help hurricane victims". Dominican Today. September 12, 2017. Retrieved September 12, 2017. ^ "Hurricane Irma leaves Dutch St. Martin 'unreachable'". PRI. Agence France-Presse. September 7, 2017. Retrieved September 7, 2017. ^ "Weather Alert – Hurricane Irma". American University of the Caribbean Medical School. Archived from the original on September 9, 2017. Retrieved September 10, 2017. ^ Alastair Jamieson; Daniella Silva (September 10, 2017). "Over 1,200 Americans Evacuated From St. Maarten Amid Reports of Violence". NBC News. Retrieved September 10, 2017. ^ "Irma, l'Armée de l'Air mobilisée" [Irma, the Air Force mobilized] (in French). French Air Force. September 13, 2017. Retrieved September 15, 2017. ^ David Smiley (September 10, 2017). "Miami police investigate looting during Hurricane Irma". Miami Herald. Retrieved September 11, 2017. ^ Staff (September 10, 2017). "More than 2 dozen arrested for Irma looting in Fort Lauderdale and Miami, deputy shoots alleged teen burglar". NBC Miami. Retrieved September 11, 2017. ^ Jane O'Brien (September 11, 2017). "Hurricane Irma: Florida launches huge relief operation". BBC News. Retrieved September 11, 2017. ^ Ian Margol (September 11, 2017). "Florida Keys residents unable to get home after evacuating for Hurricane Irma". Local10. Retrieved September 11, 2017. ^ "Florida faces Irma's devastation: Aircraft carrier rushes to the Keys; 13M are without power". New York Post. September 11, 2017. Retrieved September 13, 2017. ^ "Upper Keys Residents Allowed to Return Tuesday; Majority of Islands Remain Blocked". NBC Miami. Retrieved September 12, 2017. ^ Gwen Filosa (September 13, 2017). "Keys bridges declared safe for travel. But other obstacles remain for a return". Miami Herald. Retrieved September 13, 2017. ^ Janine Stanwood; Ian Margol; Andrea Torres (September 16, 2017). "Monroe County reopens Marathon after Hurricane Irma". Local 10 ABC News. Retrieved September 17, 2017. ^ David Goodhue (September 16, 2017). "Middle Keys residents can return Saturday, but Lower Keys will have to wait one more day". Miami Herald. Retrieved September 17, 2017. ^ Mower, Lawrence (September 12, 2017). "Hurricane Irma: Don't have Internet, cable or cell service? Here's why". Palm Beach Post. Retrieved September 22, 2017. ^ Weaver, Jay (September 12, 2017). "Can you hear me now? Post-Irma cell coverage spotty". Miami Herald. Retrieved September 22, 2017. ^ Hurtibise, Ron (September 15, 2017). "Hurricane Irma's assault on cellphone towers trigger discounts, freebies". Sun-Sentinel. Retrieved September 22, 2017. ^ "Communications Status Report for Areas Impacted by Hurricane Irma" (PDF). Federal Communications Commission. September 12, 2017. pp. 3–7. Archived (PDF) from the original on September 13, 2017. Retrieved September 22, 2017. ^ "Hurricane Irma Imagery". National Oceanic and Atmospheric Administration. Retrieved September 13, 2017. ^ Michael Mayo; Rod Stafford Hagwood; Phillip Valys; Mike Clary (September 25, 2017). "Before and after Hurricane Irma: What happened to favorite Florida Keys landmarks?". Retrieved April 20, 2019. ^ Mary Ellen Klas (September 13, 2017). "Irma leaves behind new threat. Rising flood water disrupts North and Central Florida". Miami Herald. Retrieved September 14, 2017. ^ Kovaleski, Dave (September 11, 2017). "Flooding from hurricanes in Texas and Florida bring public health risks". Homeland Preparedness News. Retrieved September 18, 2017. ^ Murphy, Eliza (September 15, 2017). "Canoe unearthed by Hurricane Irma could be hundreds of years old". ABC News. Retrieved September 19, 2017. ^ "Hurricanes Harvey, Irma sink U.S. payrolls in September". Reuters. October 6, 2017. ^ "Hurricane Irma turned this tiny island into a wasteland". The New York Post. September 13, 2017. Retrieved September 13, 2017. ^ "'This Is A Horrific Disaster': U.S. Virgin Islands Face Massive Recovery Effort After Hurricane Irma". CBS New York. September 10, 2017. Retrieved September 10, 2017. ^ "After Irma, a once-lush gem in the U.S. Virgin Islands reduced to battered wasteland". The Washington Post. September 12, 2017. Retrieved September 13, 2017. ^ Erdman, Jonathan (October 20, 2017). "Why Hurricane Maria Was Such a Catastrophe in Puerto Rico". weather.com. Retrieved January 25, 2018. ^ Philip Klotzbach [@philklotzbach] (September 5, 2017). "#Irma is the furthest east in Atlantic that we've had a 175 mph hurricane on record (57.7°W). Previous record: David-1979 (66.2°W)" (Tweet). Retrieved September 5, 2017 – via Twitter. ^ Philip Klotzbach [@philklotzbach] (September 5, 2017). "#Irma now has winds of 185 mph – tied w/ FL Keys (1935), Gilbert & Wilma for 2nd strongest Atlantic winds on record. Allen is #1 at 190 mph" (Tweet). Retrieved September 5, 2017 – via Twitter. ^ Alessandra Potenza. "Irma is now one of the strongest hurricanes ever recorded in the Atlantic". The Verge. Retrieved September 10, 2017. ^ a b "Hurricane Irma Meteorological Records/Notable Facts Recap" (PDF). Colorado State University. Retrieved September 10, 2017. ^ a b Staff Reports. "Record-breaking Irma remains on track to spare Pee Dee". SC Now Morning News. Retrieved September 10, 2017. ^ "Real-Time North Atlantic Ocean Statistics by Storm for 2017". Colorado State University - ACE Calculations. Retrieved September 12, 2017. ^ Henson, Bob. "Saipan Ravaged by Yutu: Photos and a First-Hand Account". Weather Underground. Retrieved October 29, 2018. ^ Masters, Jeff. "Winston's 180 mph Winds in Fiji: Southern Hemisphere's Strongest Storm on Record". Weather Underground. Retrieved April 8, 2018. ^ Bob Henson (September 6, 2017). "Category 5 Irma Hits Leeward Islands at Peak Strength". Weather Underground. Retrieved September 6, 2017. ^ Moore, Tom. "Monsters of the Atlantic: The Basin's Category 5 Hurricanes". The Weather Channel. Retrieved September 16, 2018. ^ Brandon Miller (September 10, 2017). "All the records Irma has already broken – and other jaw-dropping stats". CNN. Retrieved September 6, 2017. ^ Sy Mukherjee (September 10, 2017). "This Is the First Time Two Category 4 Hurricanes Have Made U.S. Landfall in a Single Season". Fortune. Retrieved September 10, 2017.